The view from a spacecraft – dark blue oceans, the multi-colored landmasses, the blue ribbon of the atmosphere and brilliant white cloudbands during the day, long shadows and hues of orange and pink in the dawn zones and finally the gleaming lights of the planet’s cities and the faint strands of aurora in the sky. Few of us will ever have the chance to go to ISS and view the ‘pale blue marble’ from low Earth orbit – for real that is. Matters are quite different in a simulation of course. 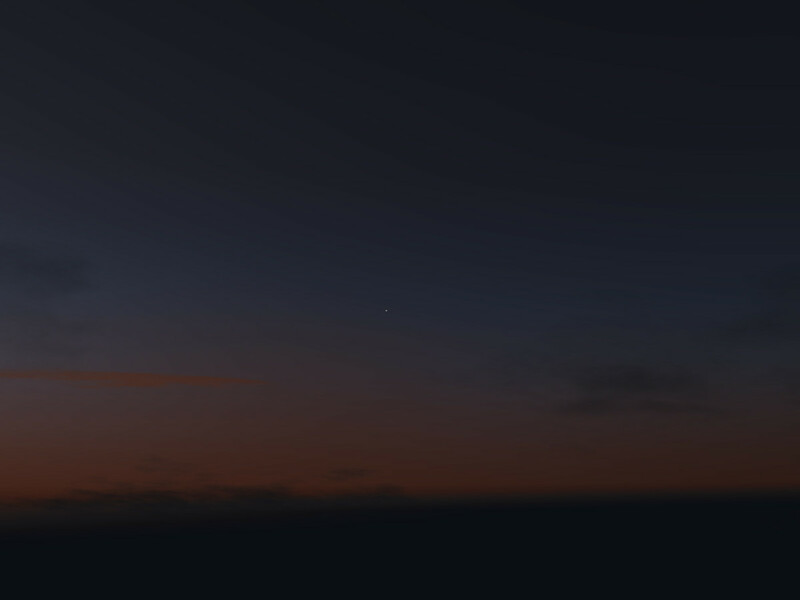 Over the last years, Flightgear’s rendering engine for views from orbit called ‘Earthview’ has undergone a lot of improvements and additions, making it one of the best visualization tools available. Lots of work has gone into the visuals at night. 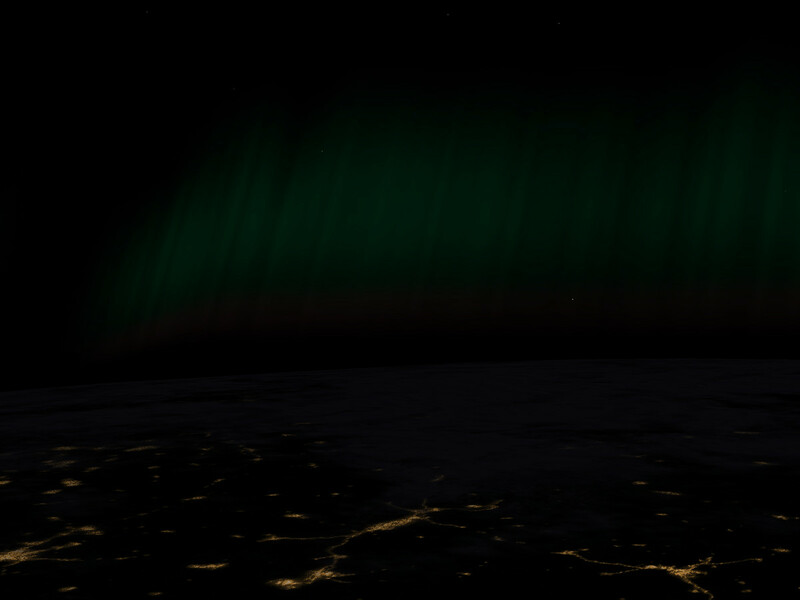 For example, a fairly sophisticated model of Aurora Borealis and Australis colors the sky around the poles. See a diffuse green glow of high Oxygen excitation for low solar activity, or a full auroral arc with slow red Oxygen lines high above, sharp green glow of Oxygen following the field line structure further down, culminating in the purple fringe of Nitrogen excitation. 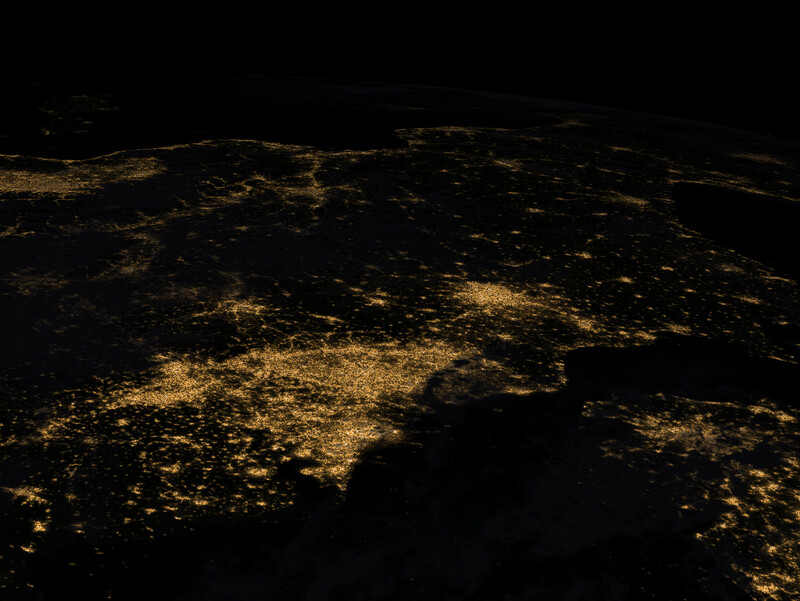 The night lights of the cities are taken from the NASA visible Earth project – but they are post-processed by a shader to give them the appearance of being composed of millions of small lights. As a special treat, there are even some thunderstorms with lightning momentarily illuminating the storm cell in a number of places – beware, they are not easy to find! Earthview also comes with its own runtime-adjustible model for scattering in the atmosphere – dry scatterers give the scene a blue hue, wet scatterers make it appear foggy. The amount of scattering follows the path through the atmosphere – there’s less atmosphere effect on mountains and high plateaus than at sea level. 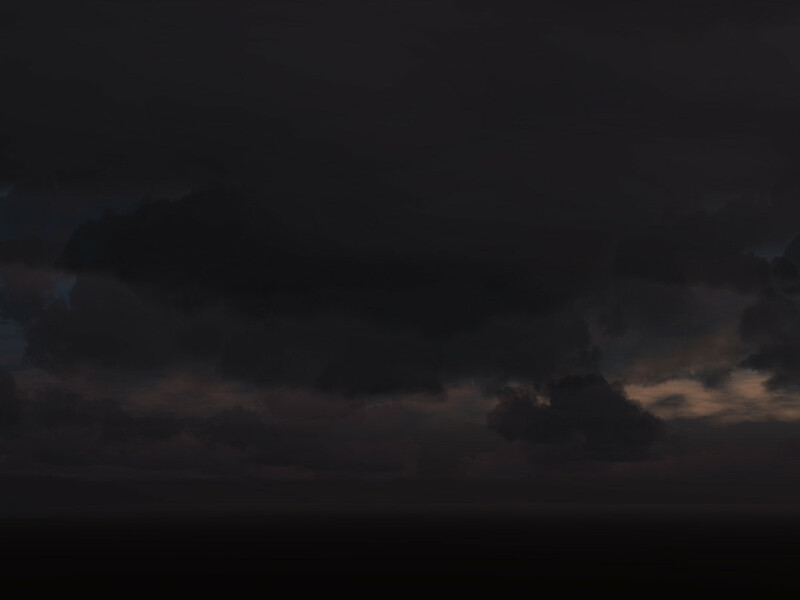 Even a semblance of weather changes can be simulated by either moving the cloudsphere or dialing the density of clouds. 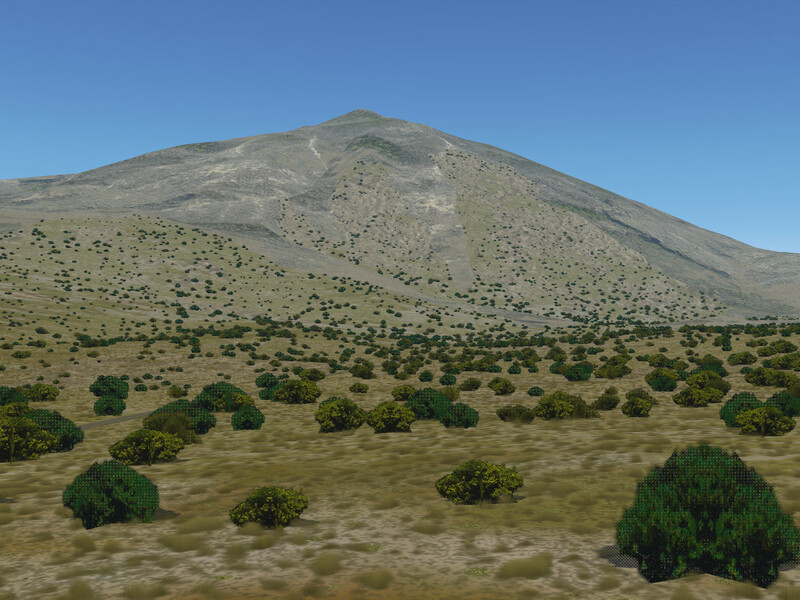 The relief mapping on the terrain give it a 3d appearance, and post-processing adds the appearance of details up to a few dozen meters in size scale. 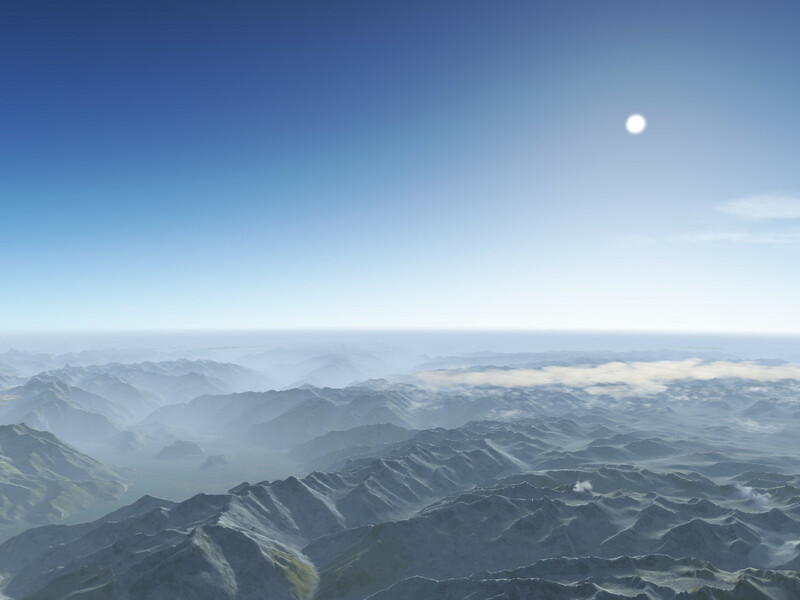 Like the terrain, the cloud map is also post-processed to show shadows and 3d appearance using parallax mapping, and clouds cast shadows onto the terrain – all of which combines to make the scene come alive. Ready to take the trip? 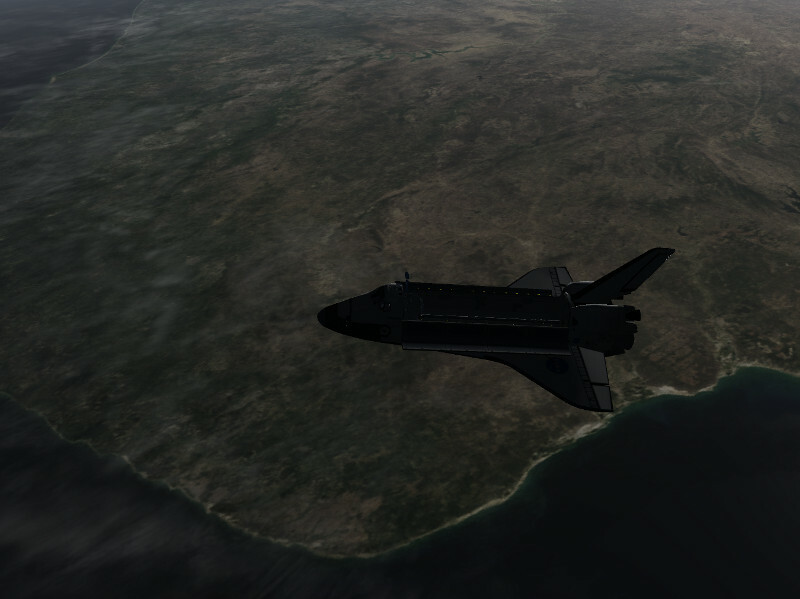 Flightgear has a handful of vehicles which can reach into space, but only two which allow to insert into a stable orbit – the Space Shuttle, and the Vostok-1 carrier. While learning to operate the Shuttle takes some time, Vostok is now equipped with automatic launch guidance, making it a good choice for your first trip into space – like Gagarin, you can just sit back and ride it out. If your memory and graphics card permits it (8+ GB are a good idea), now would be the time to install a few GB of hires textures linked on the Earthview Wiki page. These textures are not part of a normal FG installation since they are substantially larger than the whole FG data package. At every step, you can follow the Vostok stage separation in outside view and see the discarded rocket stages disappearing behind you as the next stage ignites. 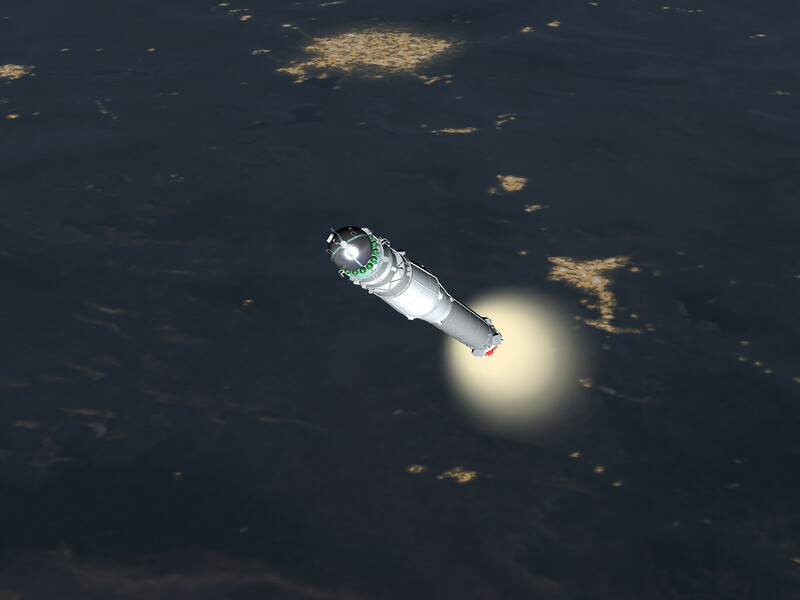 Once in orbit, you can even try to maneuver around the TDU and get back to the discarded 3rd stage. 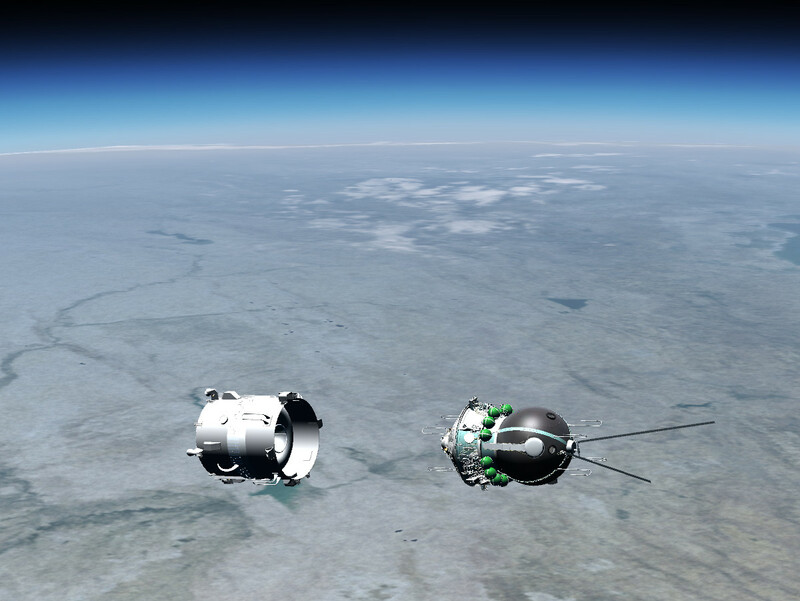 There’s not much in terms of maneuvering the Vostok capsule can really do, so you might as well enjoy the view for a few orbits, and eventually turn it around for a de-orbit burn that brings you back onto the ground. 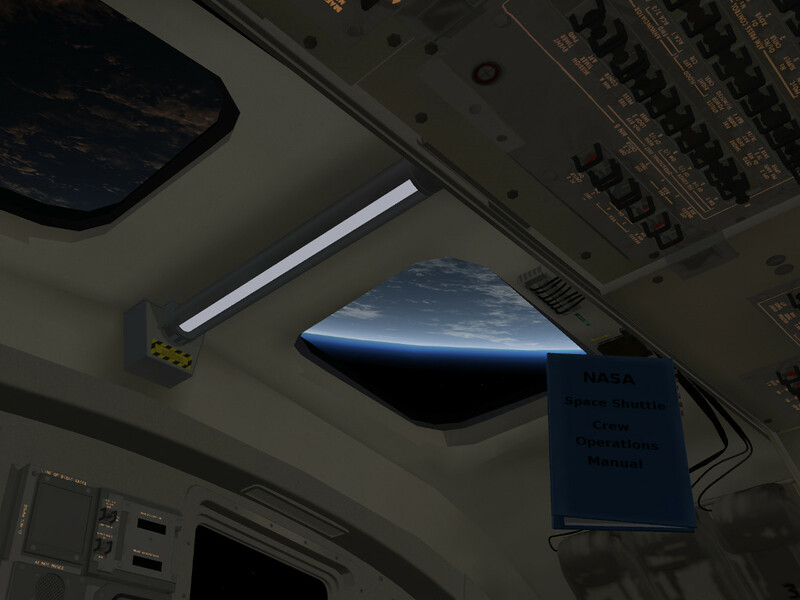 The simulation can’t give you the real feeling of weightlessness, but it tries to bring you close – in the Space Shuttle, you can put a flight data file folder in free-float mode into the cabin – you can watch Earth through the windows while the manual slowly floats through your visual field. 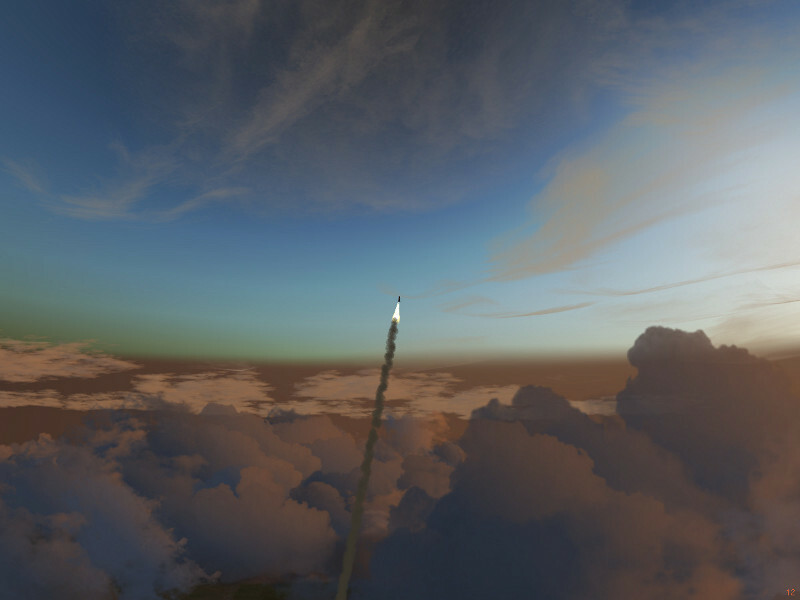 So, get out on the pad, launch into space and enjoy the grand view! The first FG release in 2018 will move to the tropical island of Oahu, using Honolulu as the default airport. 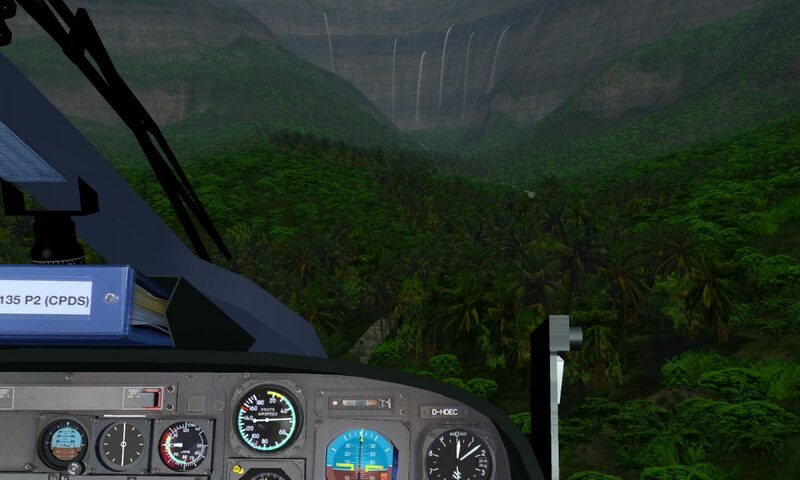 In preparation, the islands of the Hawaii chain have received a makeover – textures for the typical shrub vegetation has been added, the terrain texturing has been improved and the airport layouts have been re-generated. There’s now a lot of new things to discover – fly to the ‘garden island’ of Kauai and look for waterfalls, search for the new highly detailed aircraft carrier ‘Harry S. Truman’ cruising close to Oahu, watch a sunrise from the summit of mighty Haleakala on Maui or discover an active lava fountain on the ‘big island’. 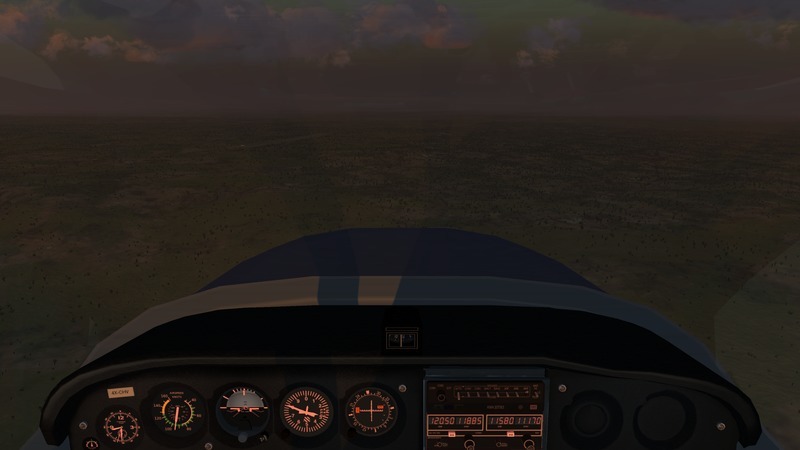 Have you ever seen a volcano eruption in a flightsim? 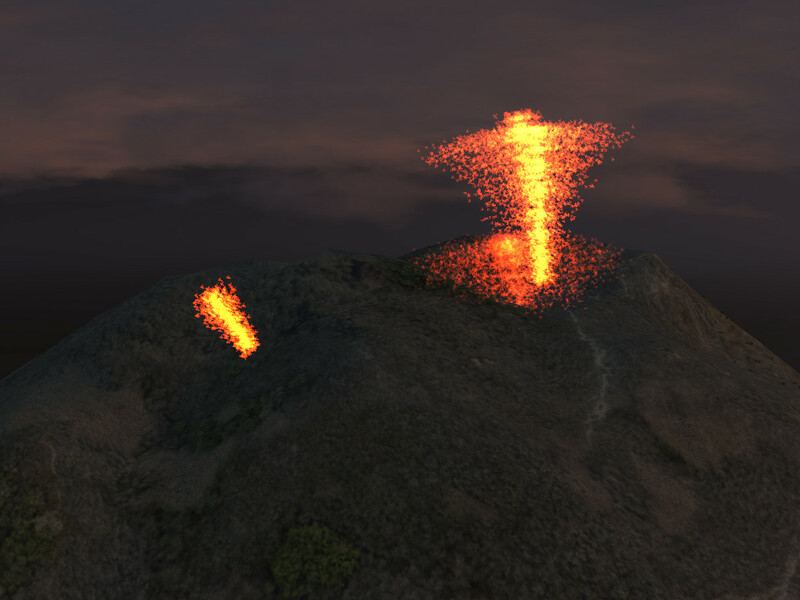 This is your chance – in the upcoming release, you won’t only be able to see lava pools and volcanic smoke of Puu’Oo on Hawaii, but also see lava fountains of the Italian volcano Stromboli and even the mighty ash plumes blown high into the air by an eruption of Etna on Sicily. The activity of all these volcanoes can be adjusted from the Environment GUI. The current implementation is still limited, but in the future, volcanic ash might actually interfere with the weather and aircraft operations – just like in reality. 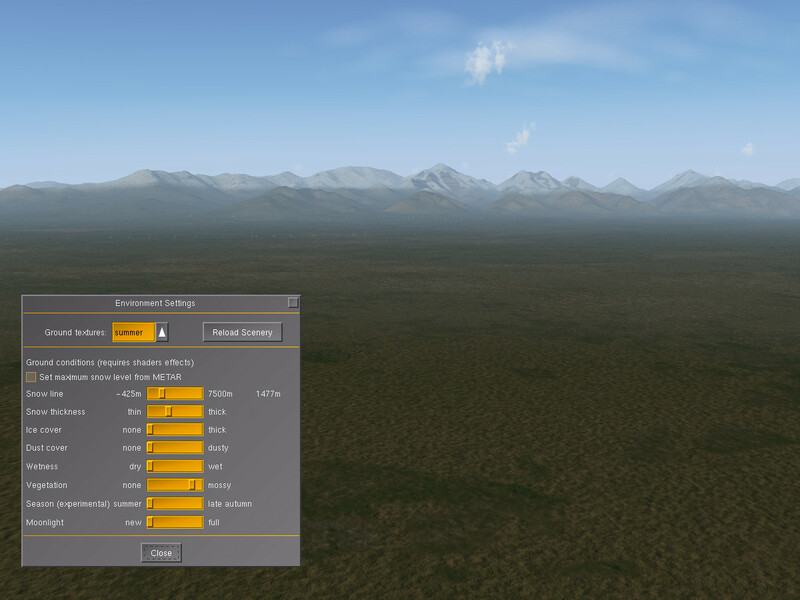 Using geometry shaders, the Atmospheric Light Scattering rendering framework now offers the option to see dense volumetric grass layers on the airport greenspaces, as well as rendering additional 3d layers of vegetation underneath the regular random trees and shrubs in regions where this is configured. This offers the eye a pleasantly high level of detail even at close range and adds much to the visuals. While this technique might be heavy for older graphics cards, the performance on a modern high-performance graphics card is excellent. 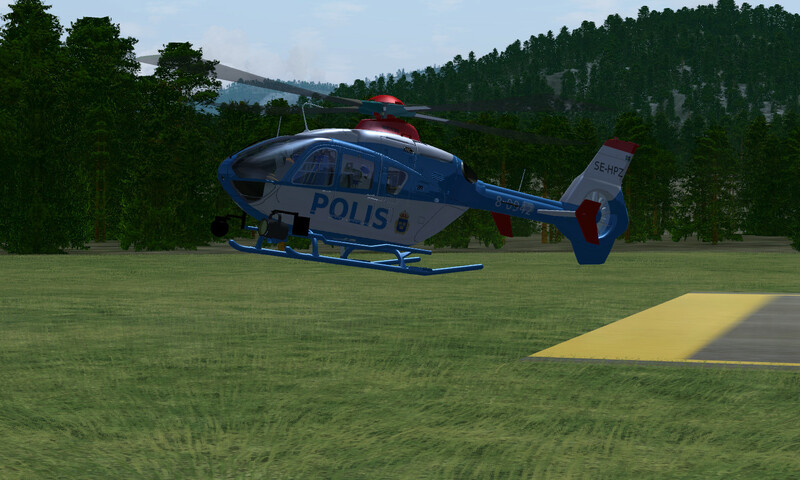 Have you ever wanted to fly a helicopter, but didn’t manage to get it off the ground? The Alouette-III now comes with a helper (or flight instructor) for you – Amelia. Amelia (named after aviation pioneer Amelia Earhart) is an animated co-pilot capable of taking off, landing and hovering the helicoper for you, according to your instructions. You can simply ask her to get the craft off the ground for you, then fly it a bit forward and then take over from her. Or, if you’re interested in operating the winch and doing rescue operations, she can hover over a spot and move slowly to the right spot according to your directions. 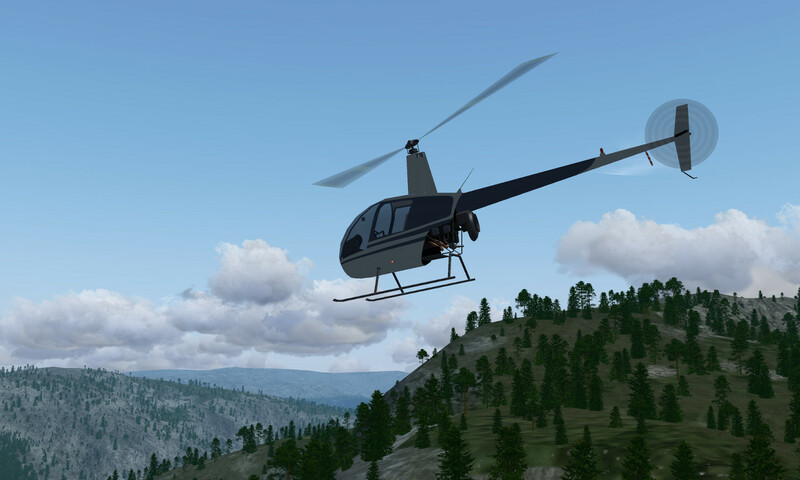 A lot of development has happened for various aircraft – for instance the Robinson R44 helicopter has received a stunning new 3d model and many systems are now simulated in detail. 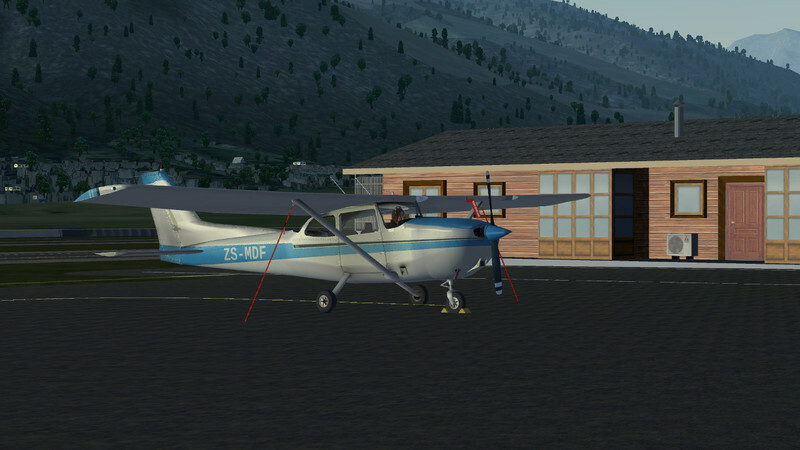 Another great addition, both in terms of visuals and systems, is the new Cessna C-182. 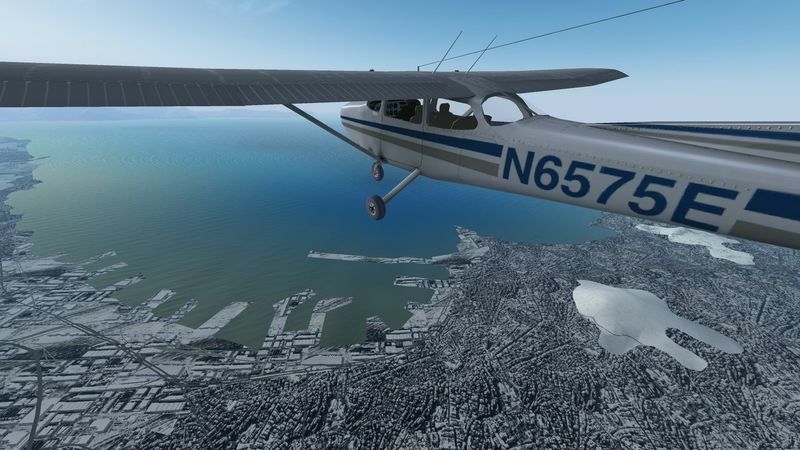 If you like single prop aircraft and want to see something more modern than the default C-172p, try it out – it makes for a great plane to do sightseeing in Hawaii! 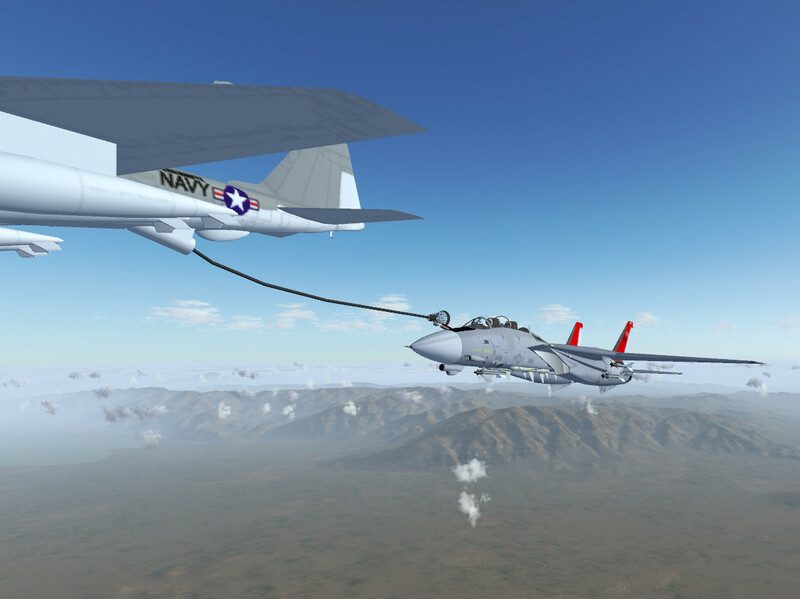 The carrier handling of the F-14b is now much more realistic, with arrestor wire effectivity dependent on speed at touchdown, more realistic low speed aerodynamics during the approach and correct ‘kneeling’ of aircraft when on the catapult – take the F-14 to the ‘Harry S. Truman’, and you won’t be disappointed! Lots of details have also been added to the Citation-II business jet and bugfixes, gear damage, a correct autopilot and an improved radar to the F-15. Stay tuned as we launch the next release! 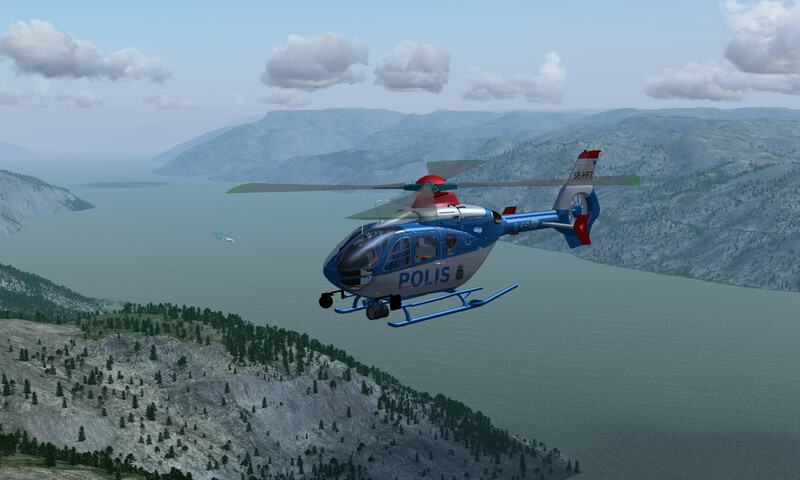 While most Flightgear users seem to mainly use GA aircraft or airliners, the simulation of helicopters is not only possible but comes with a nice degree of realism. This makes learning to fly a helciopter quite a challenge, but also very educational. 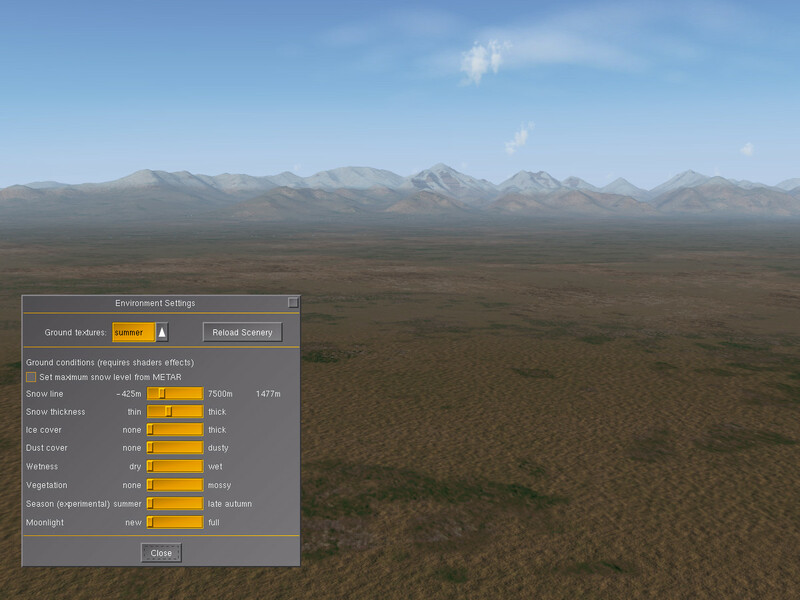 Piloting a helicopter is also a nice opportunity to see the terrain in a different way, because usually the view downward is much less restricted than in aircraft cockpits – here a good graphics card to support all the hires terrain texturing and the various vegetation and building overlays that can be enabled really pays off. And of course you can land pretty much anywhere you like, airports are no longer a must, any flat patch of terrain will do. But there are also hundreds of helipads in the FG scenery, located on places like hospital rooftops or oil rigs. Ready for takeoff? Let’s take a quick look at some helicopters FG has to offer. If you’ve mastered flying normal aircraft and have the idea that helicopters can’t be so different, you’re likely wrong – helicopters are very different. Normal aircraft are usually dynamically stable – if they feel a perturbation, they return to a stable attitude. Helicopters reach this condition only when they accelerate, but just after takeoff and before landing they move through the air slowly, and they’re in fact dynamically unstable – any perturbation needs to be countered quickly with the controls, or it will grow and the pilot will lose control. Another thing that takes some time getting used to is that the body of a helicopter swings like a pendulum underneath the rotor. The pilot always needs to recognize when a motion is part of this oscillation and will dampen out on its own and when it is actually part of the flight dynamics. Yet perhaps the hardest thing to master for beginners is the torque of the rotor. The rotating blades try to yank the helicopter around against their own motion, and only the action of the tail rotor prevents this – so pedals need to be used carefully to counter this effect. So how is a helicopter controlled? Unlike in an aircraft, the turbine RPM is usually not throttled. Rather, the angle of the main rotor blades is changed by the collective control- this provides upward/downward motion. 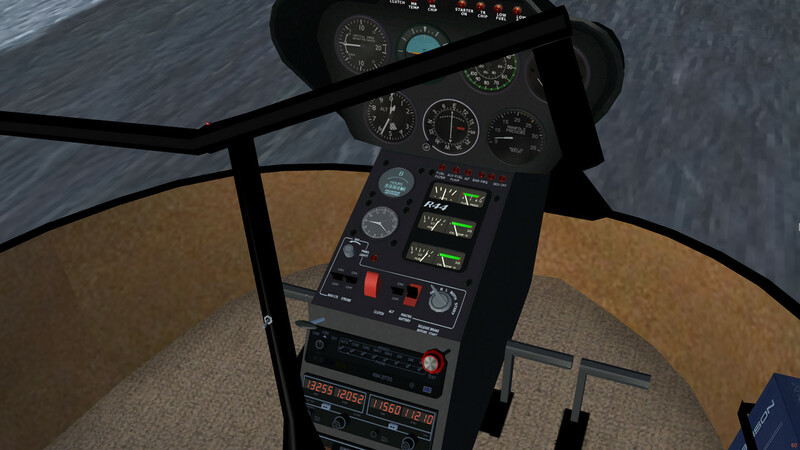 The main rotor can be tilted by moving the stick, this provides a combination of forward and sideward motion. It is actually quite feasible to fly a helicopter sideward, or even backward if it is done slowly, only once the airstream becomes fast, the fuselage tries to align with the wind like for an aircraft. 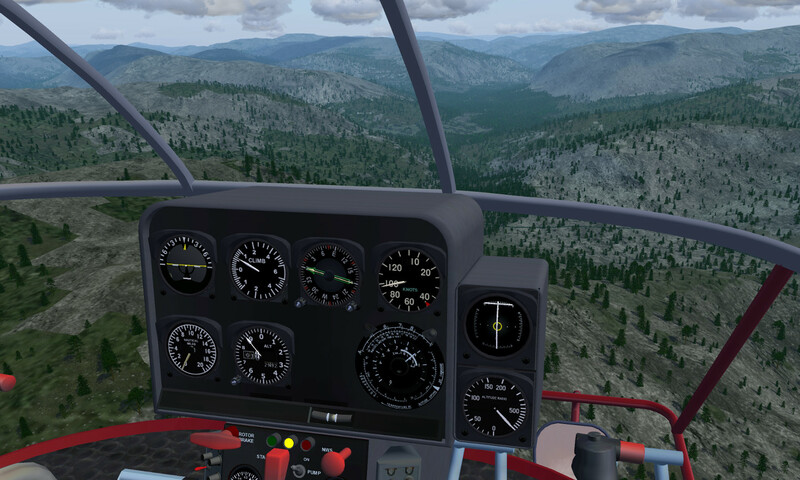 Finally, the pedals control the tail rotor action – they can be used both to stabilize the craft against the main rotor torque as well as swing the nose around into a new direction in hover flight. 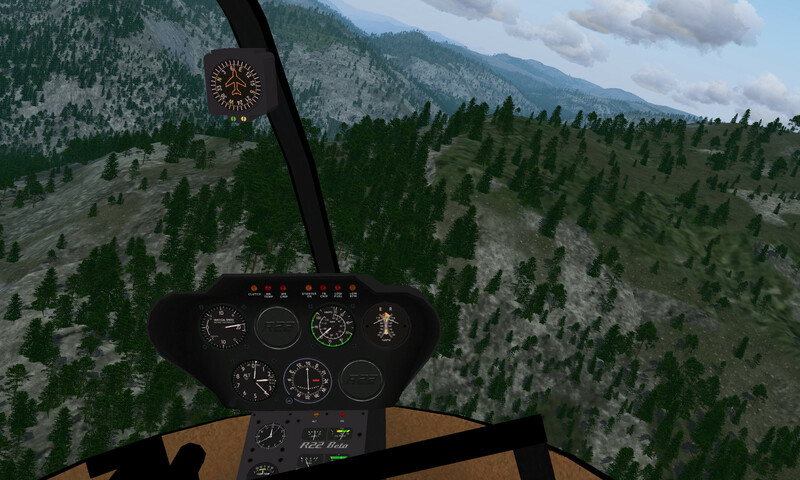 The final important ingredient to understanding helicopter flight is the ground effect. If the air displaced by the main rotor can’t go anywhere quickly because there is terrain underneath, it forms a ‘cushion’ of air that keeps the helicopter afloat. The effectivity of this cushion decreases quickly with altitude, thus close to the ground the collective actually controls altitude rather than vertical speed. Setting the rotor to displace more air pushes the helicopter upward, but then the ground effect decreases, so the craft settles at a new altitude. A helicopter is then taken off by hovering into the ground effect, then using the stick to induce a forward motion (which gradually causes more lift on the rotor blades), and only when it is faster than some minimum speed flown out of the ground effect region. Similarly, one can expect and anticipate the ground effect for a landing. While all these effects are there for any helicopter, the degree to which they make themselves felt differ quite a lot, and so every craft has to be learned separately. If you were to attend real helicopter flight training, the Robinson R22 is the type of helicopter you would most likely encounter – it’s a low cost craft, popular throughout the world as a trainer or utility helicopter. The R22 has a low inertia rotor system, and the control inputs are transmitted directly by rods without hydraulic assistance. This means that the controls have to be moved very gently to avoid overcorrecting, and overall the helicopter reacts rather finnicky. This does seem to make it a bad choice for a trainer, except the idea seems to be that if a flight student masters the R22, she won’t have any problems with a heavier helicopter. The instrumentation is generally simple, giving the pilot an almost unhindered view through the windshield. 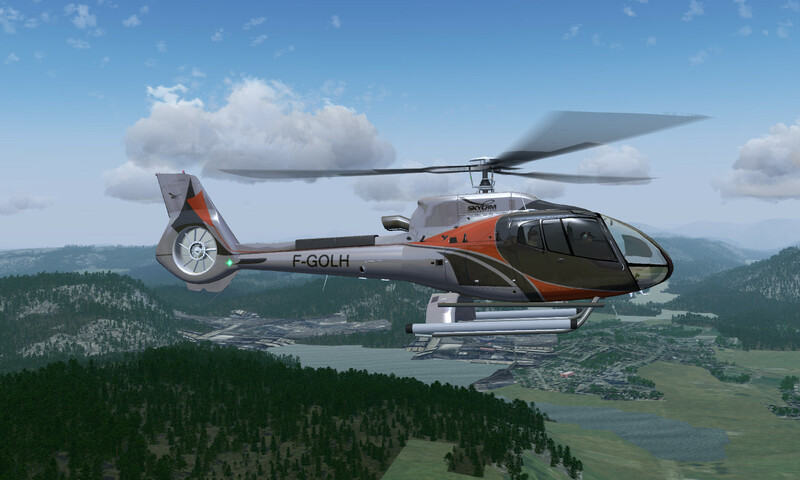 In Flightgear, the R22 definitely exhibits the characteristics of the original counterpart. There’s lots of torque which is difficult to compensate, and you need to work a lot for even a halfway decent hover flight. Also, bringing the R22 into level flight with a good trim is far from trivial. The Alouette III is an aging light utility helicopter, in service since 1960, mainly used by military forces around the world, used for tasks ranging from passenger transport to aerial ambulance and SAR. Compared with the R22, it is a much heavier machine and hence considerably less skittish on the controls. 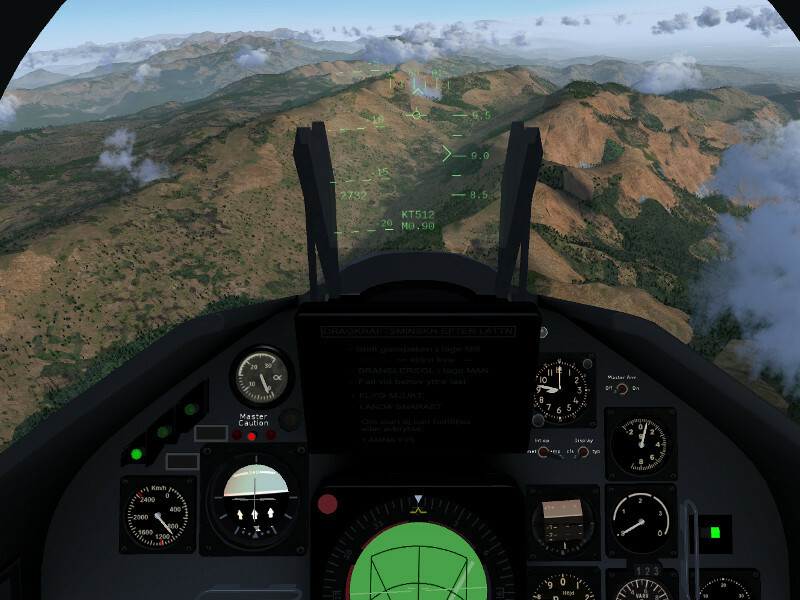 In the Flightgear version, the startup and shutdown sequences are implemented and the instrument panel is largely functional. What takes a bit to get used to is that this helicopter has wheels rather than skids, which makes sometimes for a surprise when landing in sloped terrain. As a medium-sized utility helicopter, the Sikorsky S-76 dating to the 1980s comes with quite a bit of modern avionics aboard. Two turbines pack a lot of power, and the craft also features a retractable gear for better cruise performance. Unfortunately, the avionics of this helicopter is not fully implemented in FG, but it nevertheless is a nice classy craft to fly. 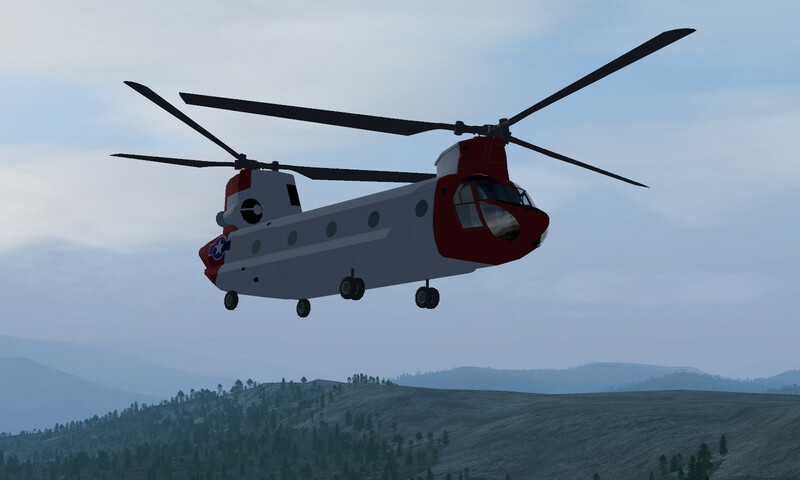 The mighty Chinook CH-47 is a heavy lifter used by the US Army since the 1960s, both for transport as well as for aerial assault purposes, inserting troops behind enemy lines. Unlike any of the helicopters above, the craft features counter-rotating twin rotors which removes the need for a tail rotor. This (and the large mass) make the flight fairly stable and the helicopter feels a bit sluggish at the controls. Unfortunately, many instruments are modeled in the panel but not actually working, which limits the experience somewhat. A truly modern light utility helicopter, the Eurocopter EC 130 was introduced in 2001 and is in strong demand around the world. It comes with a modern avionics set and (for its weight) a fairly powerful engine. 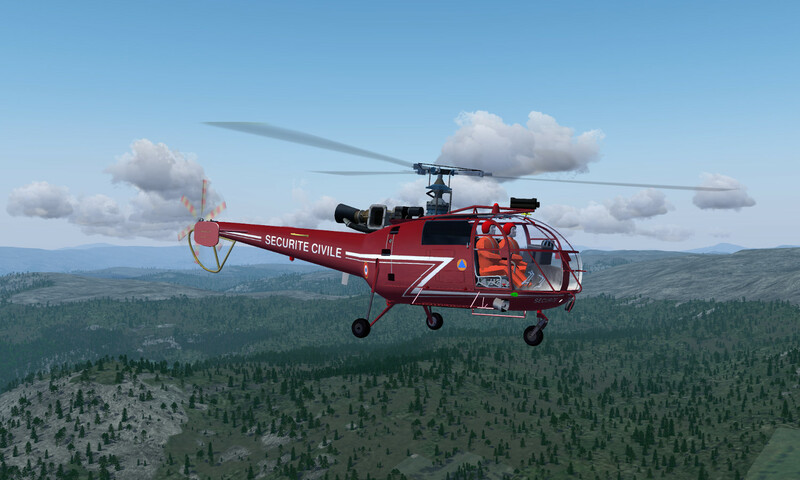 In the simulation, the EC 130 is, hands down, one of the most stunning models with a photorealistic exterior utilizing pretty much every rendering effect available. Once in the cockpit, there is a detailed startup and shutdown procedure available that’s supported by the checklist system. In addition, many different configurations and pieces of equipment (such as external baskets or a serchlight) can be chosen. Once you try it, you’ll love it. Introduced in 1996, the EC-135 is another modern light utility helicopter used for multiple purposes ranging from medical transport and SAR to sightseeing. Powered by two turbines, it packs even more horsepowers than the EC-130. 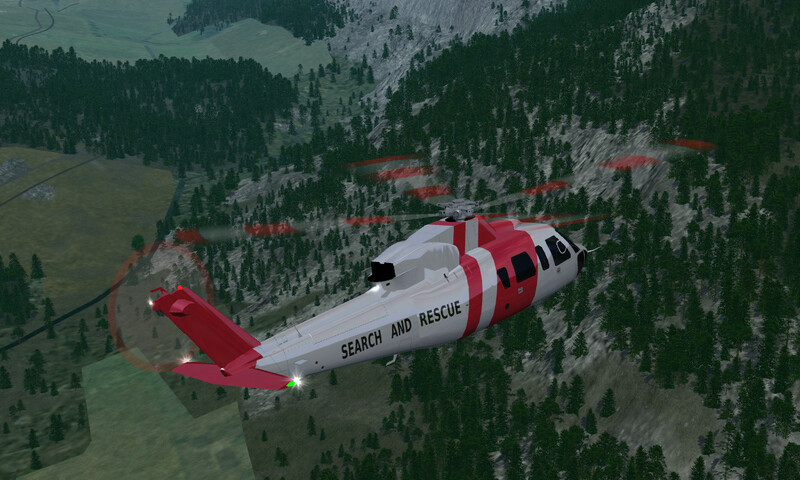 Both the interior and the exterior of this helicopter show in FG at photorealistic quality. The EC-135 is a truly remarkable piece of work, both in the flight characteristics and visually. 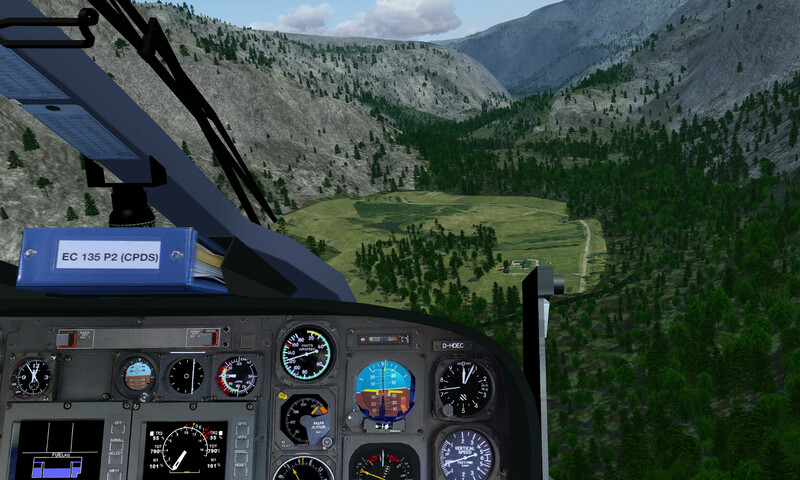 Eager to try out helicopter flight now? While the R22 is what real flight students learn with, the craft is very hard to master without the helping hand of an instructor. Since you’re not paying for simulated damage or flight hours, you might as well start with a heavy machine such as the Chinook to get a feeling for the basics of helicopter flight without the complication of rotor torque, and then move on to a ‘nice’ machine like the Alouette III before tackling the really hard craft. Don’t be discouraged by failures – you’ll probably crash the first dozen times before getting the ride off the ground properly, and it really takes a while to get the correct ‘feel’ for the controls such that good hover flight and precision landings are feasible. This is much harder than flying an airplane. 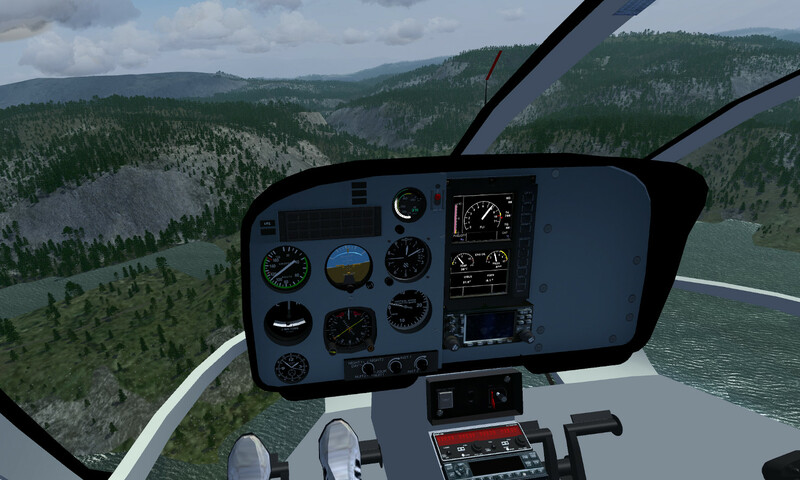 For a good introduction to the techniques of helicopter flight in FG, see the Flightgear Wiki. If you’re looking for a challenge away from busy airports, IFR flight and traffic controllers try flying up in the North for a while. Remote dirt airstrips, spectacular scenery, challenging mountain flights, tricky navigation in rough weather – Alaska offers all of this and more. In such a sparsely populated region, you need a special kind of plane – easy to maintain, with a short takeoff or landing distance and capable of taking a lot of punishment. Such as the Twin Otter. The de Havilland Canada DHC-6 Twin Otter is STOL-capable small passenger turboprop aircraft, ready to carry up to 19 people. The sturdy, non-retractable undercarriage, the short takeoff and the high rate of climb make the aircraft very suitable to serve small airstrips in remote and mountainous areas. 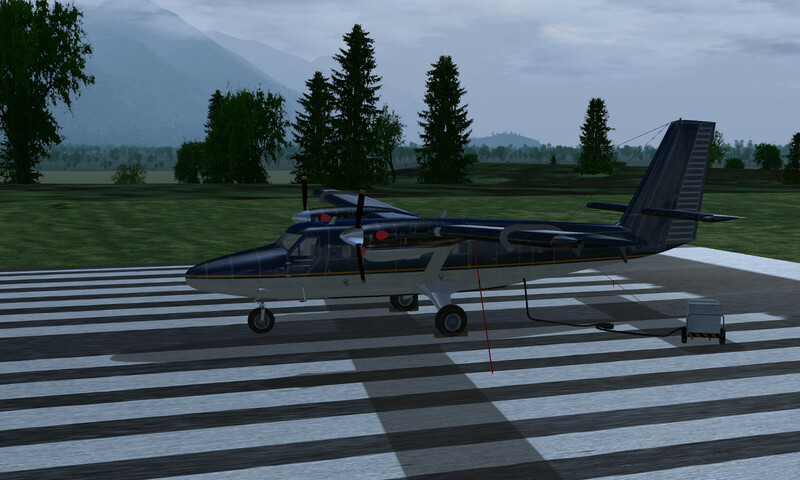 In addition, Twin Otters can be fitted with wheels, floats or skies, allowing them to operate even off reinforced runways. With a cruise speed of 150 kt, a service ceiling of 25.000 ft and a range of about 800 miles, the aircraft does not have the abilities of commercial jets, but its handling qualities more than make up for it. 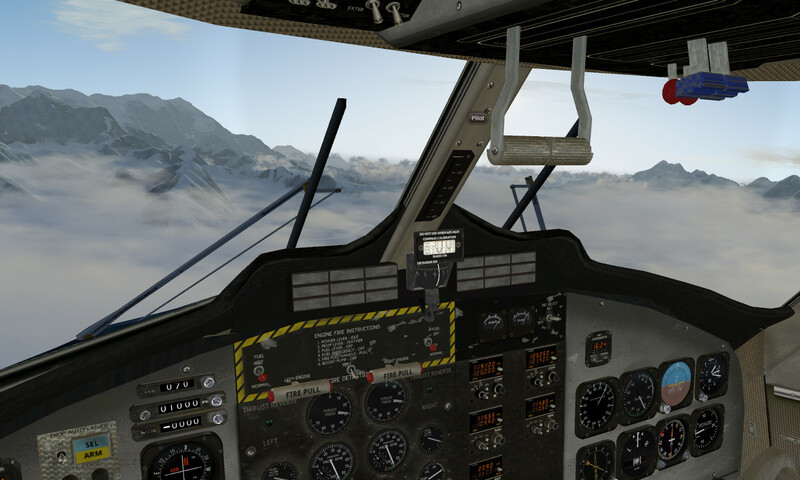 The Flightgear version of the Twin Otter has a lot to offer – starting from a spectacular 3d cockpit over lots of simulated systems to detailed procedures. When starting in the plane, you find it in secured position, with external power connected. Every flight starts with the pre-flight inspection, the tiedowns and pitot tube covers have to be removed, the wheels unblocked. 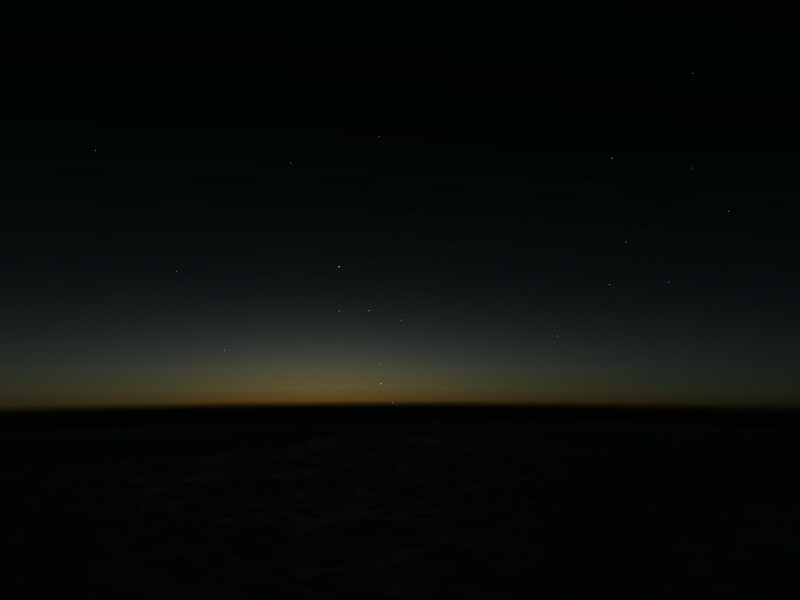 Using Flightgear’s walker feature, you can literally get out of the plane and walk around, doing your pre-flight checklist. Once you climb into the cockpit, you can then start the engines and switch to internal power. The plane makes excellent use of the checklist feature, with the ability to highlight every control that needs to be operated next, so you won’t get lost easily. The cockpit artwork is simply great, close to photo-realistic, and there are lots of details to discover, from the way the windshield heater has a real function to ‘No Smoking’ signs for the passengers. The flight dynamics is modeled using YaSim, which doesn’t make it overly realistic at the corners of the operational envelope, but the basics are all there and the simulation nicely captures the STOL and high climb rate of the plane. There’s no simulation of damage due to overstressing the plane done, but callouts of limit violations can be activated (and of course you can crash and destroy the plane). If you’re in for a real challenge, start with a variant that has either floats or skies – if you have floats, you can actually select starting sites on the water (or get the option to re-position to a nearby site). A very nice bit of scenery is East of Valdez (PAVD) following the Bagley Ice Field towards the Seward Glacier at the foot of Mt. Logan, which towers a full 19,501 ft above sea level. The Twin Otter will be able to take off from almost any small airfield, so we can explore this from Cape Yakataga (PACY). It’s going to be a cold flight, so remember to activate Pitot tube and propeller heaters, otherwise there’ll be nasty surprises later. 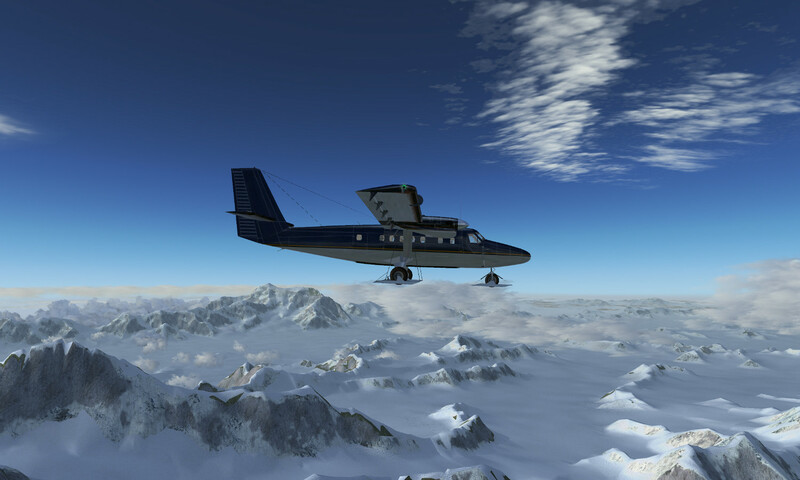 Fly north and start climbing over the first mountain ranges at about 10.000 ft – behind the peaks you’ll get your first visual of the Bagley ice field stretching in east-west direction. Follow the glacier east until you see towering Mount Logan to your left, reaching up to almost 20.000 ft and opposite to it, slightly lower, Mount St. Elias. 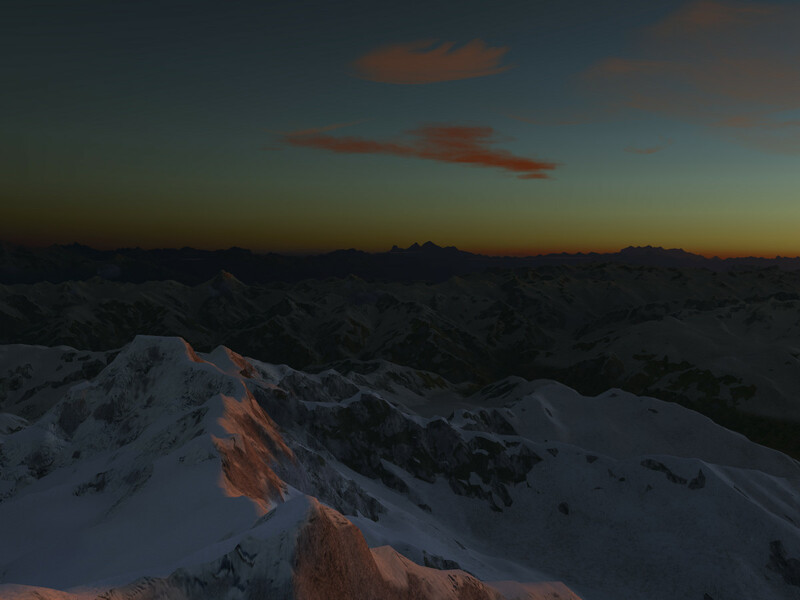 Then turn towards Mount Logan. If you have skies equipped and dare to, you can try landing on the Bagley field or on one of Logan’s glaciers – it’s quite a challenge. 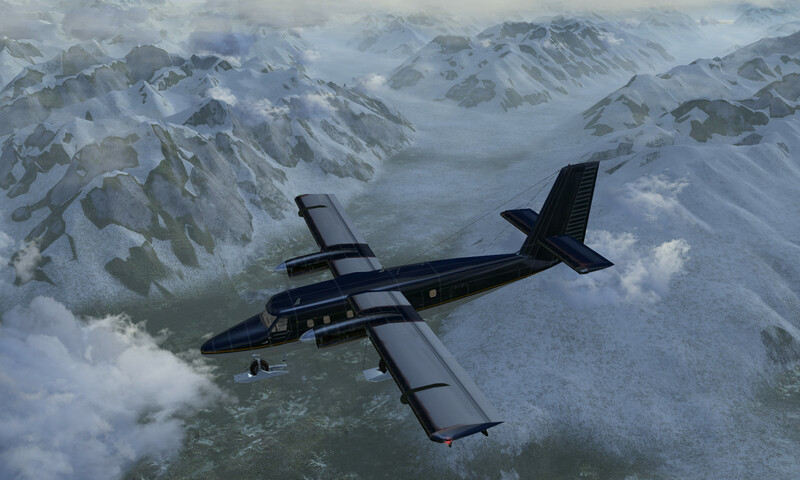 The Twin Otter reaches high enough to make the summit of Mount Logan, so start climbing again. If the visibility is good, you can see several other towering peaks over in Canada. Turn back west and follow the glacier valleys branching north of Bagley field, forming the Logan glacier. 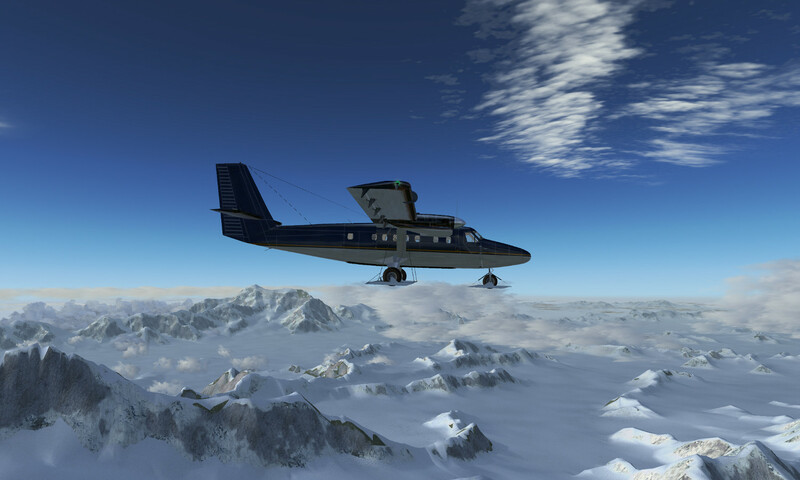 You’ll be rewarded by stunning views deep into ice-carved valleys. Follow the Logan glacier valley till the ice disappears and mighty watercourses carry the meltwaters of the ice fields. We’re going to end the flight at Jakes Bar, which is a small dirt airstrip in the middle of nowhere. Like many small field in Alaska, it doesn’t come with a radio beacon, so you’ll have to find it by eye – it’s where a meltwater stream coming from the south merges with the water from Logan glacier. There’s not much space here – but nothing the Twin Otter couldn’t handle. 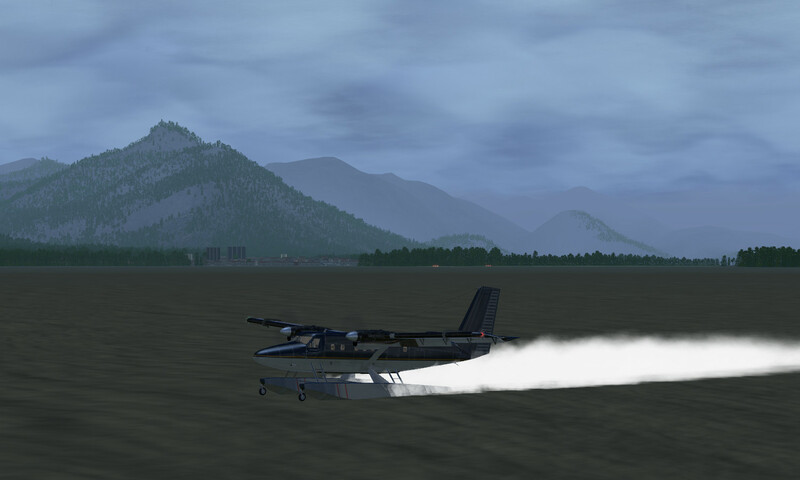 Quite different but equally stunning scenery is found in the vicinity of Juneau airport (PAJN). Here the sea meets steep mountains and glaciers and fjords and islands dominate the scene. Equip your Twin Otter with floats to enjoy this best – you can start right in the water, for instance at Tenakee. Admittedly starting the engines in the water is a bit ticky (expect to spin around while only one engine is running…), but water takeoffs and landings are really great fun (if the winds are not too strong – high surf can definitely ruin your day). Once in the air, you can expect the flight dynamics to be somewhat different (the floats after all have different drag), but the Twin Otter has very high engine power, so it’s never a problem. You can fly across forst-covered hills, majestic straits and explore remote bays, or fly over the Taku glacier north of Juneau – there’s plenty to see. And the best part is – with floats you can land pretty much anywhere you like! Again, maneuvering on the water can be a bit tricky, differential throttle on both engines, or even putting one engine into reverse thrust works best. And if you want to land on solid ground again, there’s still an operational gear attached to the floats – just don’t forget to extend it! The Saab JA-37 ‘Viggen’ (the name goes back to an old Swedish word and means ‘thunderbolt’) is a Swedish single seat all-weather interceptor aircraft variant. With it’s delta wings and the canard surfaces, it is a most iconic sight, and when the first prototype of the design was rolled out in 1967, it was considered one of the most advanced aircraft at the time. The main design requirements were based on the notion that the aircraft would have to be operated from improvised airstrips, thus both the ability to utilize short (and, given Sweden’s climate, possibly frozen or snowy) runways and easy maintenance were considered very important. In fact, the ‘Viggen’ was constructed to cope with just 500 m of runway, yet to reach Mach 1 at sea level and Mach 2 at high altitude. This is made possible by a powerful Volvo RM8 turbofan engine augmented with both an afterburner and a thrust reverser – the latter being fairly unique among fighter aircraft (only the Panavia Tornado is similarly equipped). 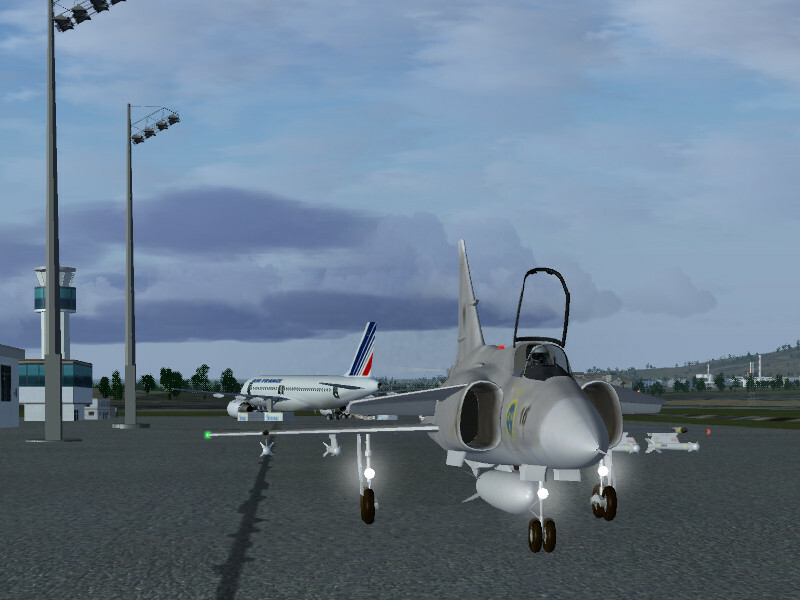 The aircraft simulated in Flightgear includes the JA-37 as well as the AJ-37 and the AJS-37 variants. While the 3d cockpit is not the kind of photorealistic work to create an immediate ‘Wow!’, there’s also nothing jarring or severely amiss. 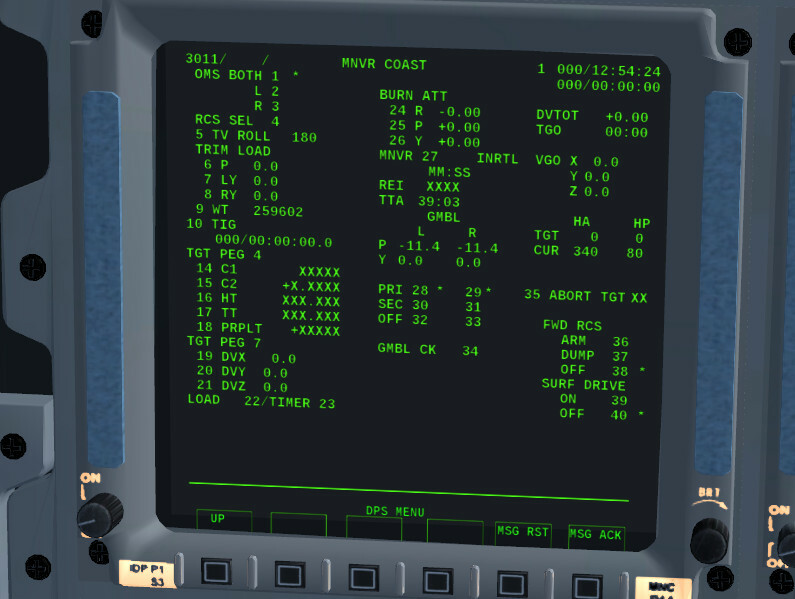 Faithful to the original, all gauges on the main panel show metric units and many labels are in Swedish, but if Flightgear’s tooltip function is activated, just hovering with the mouse over a gauge explains in English what it is and provides the value in imperial units. The HUD can likewise be switched from metric to imperial units. Away from the front panel, switches and warning lights are typically labeled in English to help the international user, and also the various audi-warnings produced by the aircraft are in English. 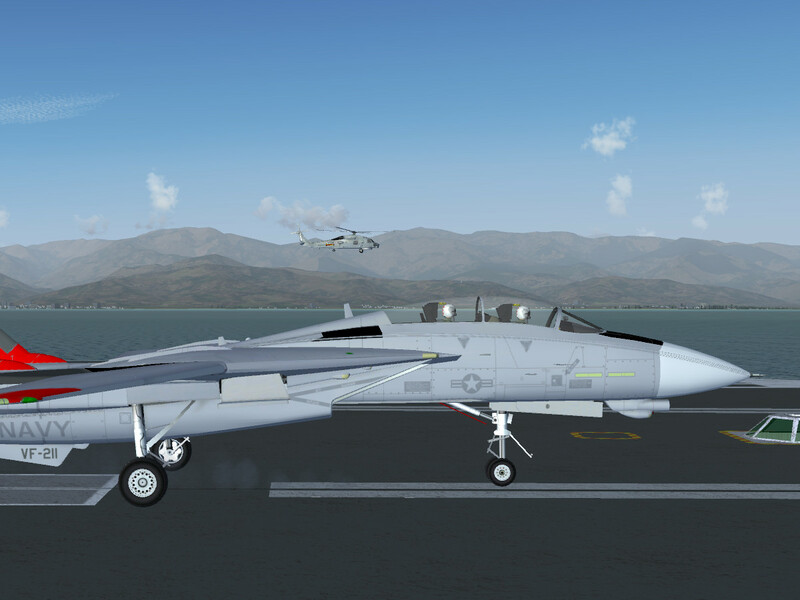 From the outside, the 3d model is rather compelling, and the plane comes with nice effects implemented – such as Mach shockwave and afterburner flame light illuminating the fuselage – in addition to lots of livery options. The aircraft starts up with engines off, but if you want to get into the air quickly, there’s a quickstart function provided. 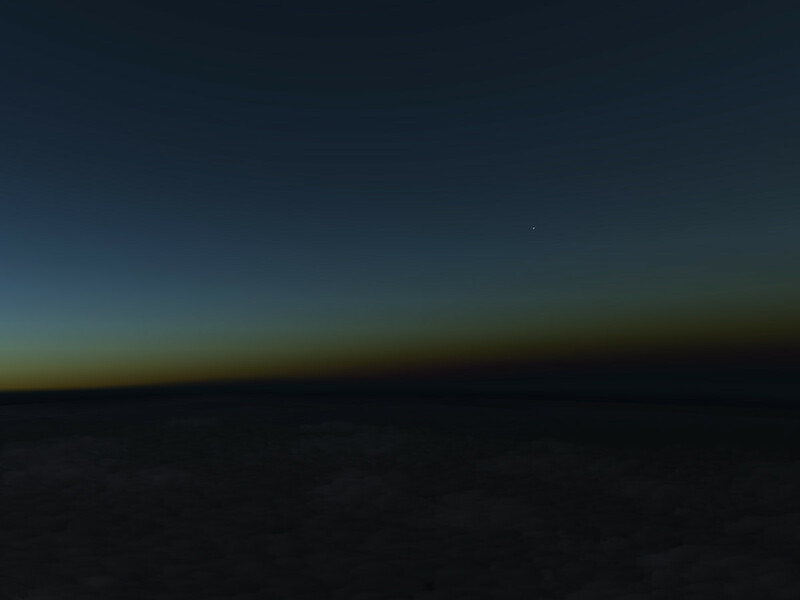 Once in the air, you can enjoy highly detailed flight dynamics. There’s tons of windtunnel and engine performance data worked into the FDM, including the behavior at very high alpha, so there’s realistic departure from controlled flight, including stalls and spins modeled. The attention to detail shows, it’s one of the planes which just feel real. For instance, when approaching the transonic region or a high alpha regime, the plane starts to shake slightly. 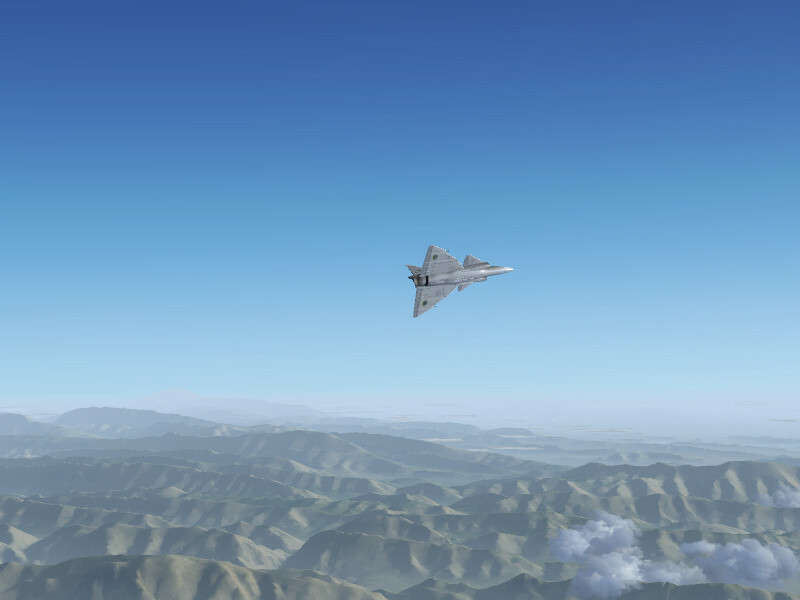 Generally the ‘Viggen’ is easy to handle and one can quickly get the hang of flying the approach and landing. Faithful to the original, the plane can be brought onto the runway at fairly low alpha without a pronounced flare, and using the thrust reverser after touchdown is great fun. Beware though – damage is modeled, and pulling too high g or smashing onto the runway will break the plane! 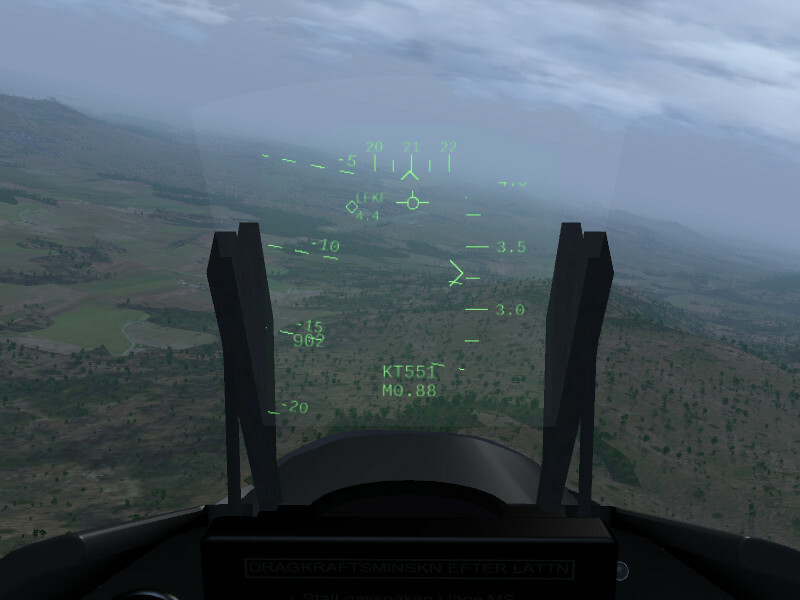 Most interaction of the pilot with the avionics is probably through the HUD. 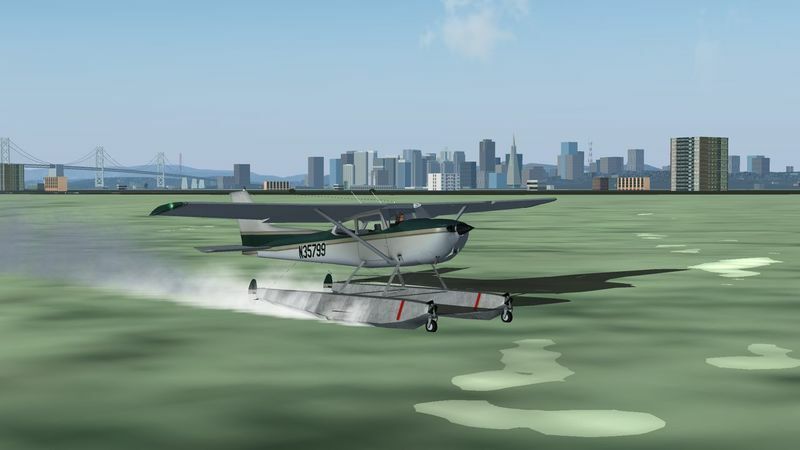 Generally, the plane tries to be helpful and allows the pilot to focus on flying. There are four main HUD modes (takeoff, flight, tactical and landing) and with the exception of the last, they switch automatically as needed. The plane also automatically tries to tune into nearby ILS frequencies, so when you approach a runway equipped with ILS, not only the airport designation but also ILS symbology will magically appear. There’s lots of other small details to discover in the way the HUD works and interfaces with other systems aboard. With close to a hundred working switches in the cockpit, the pilot can go through fairly realistic startup and shutdown procedures. 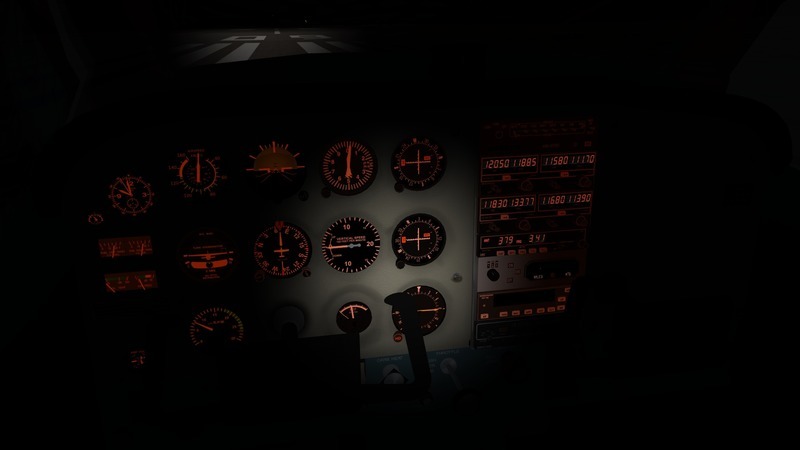 The ‘Viggen’ makes good use of the Flightgear checklist functionality, with the option to highlight the control that should be operated next, or to automatically complete an item. 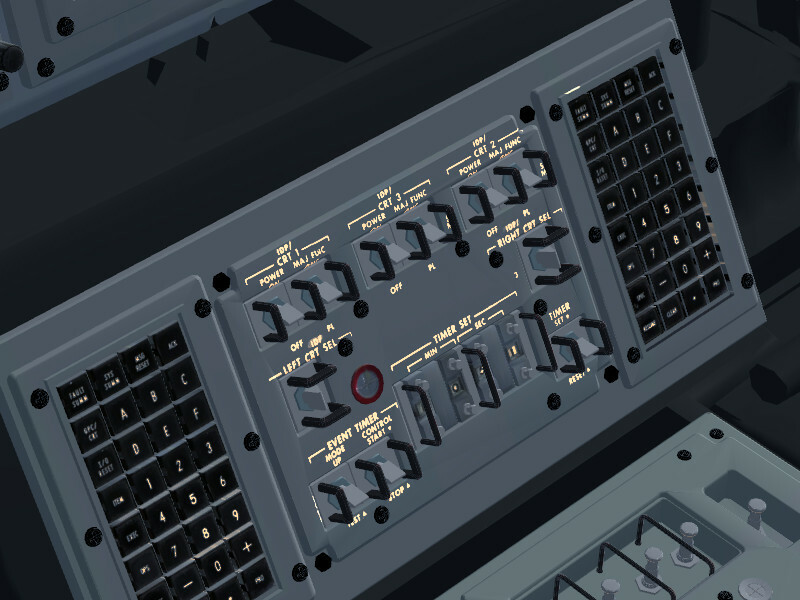 As an added surprise, the state the airplane is in when starting up is somewhat randomized in that sometimes a switch may already be flicked, sometimes not – a good way to keep the user’s attention on the checklist! You probably won’t find too many planes on the Flightgear repository which have the systems modeled down to a working air-condition unit – but there it is. If you allow the cabin air to get too cold or too warm, not only will you see on-screen messages that you’re getting uncomfortable, but also the canopy will frost or fog, impairing your view. There’s lots of other things modeled, among them a well-tuned autopilot, automatic control of flaps, an electrical system in which you can drain the battery and will see lights dim in response and last but not least a full range of working weapons systems, ranging from the cannon to un-guided air-ground missiles. 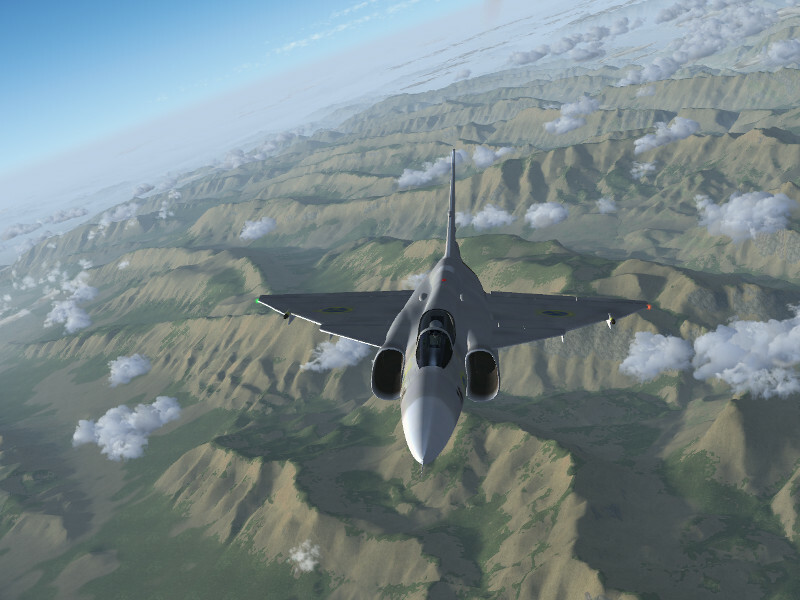 If your definition of ‘realism’ in a flight simulator goes beyond photo-realistic 3d modeling and you can get excited about very detailed flight dynamics and systems modeling, the ‘Viggen’ is a plane for you, and you can well spend a few hours exploring all the little details that are lovingly worked into the simulation, from a large range of sounds via the simulation of different damage modes to the way the radar interacts with MP or AI planes and can get blocked by the terrain. Well-implemented checklists and tooltips as well as the quickstart and shutdown functions make it easy to get used to operating the plane – give it a try! 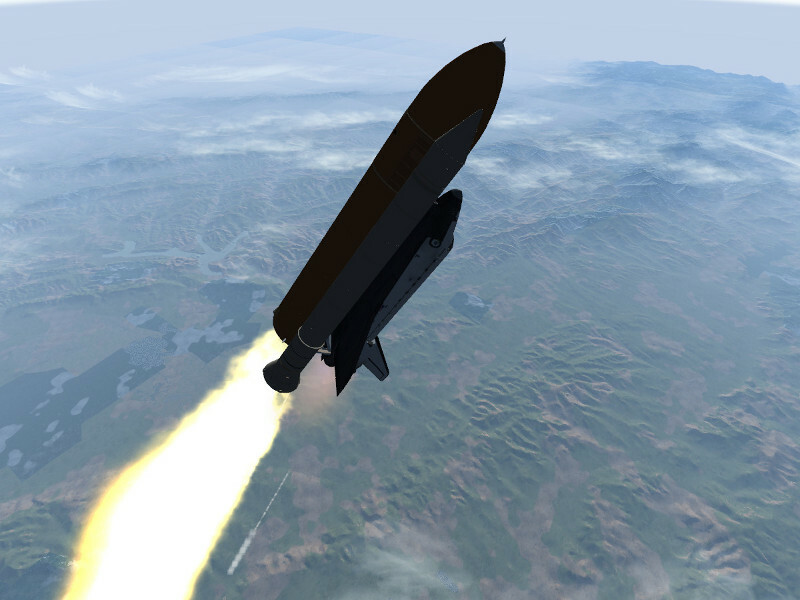 After Vostok-1 and the X-15, Flightgear now adds the third craft capable of reaching space – the Space Shuttle. 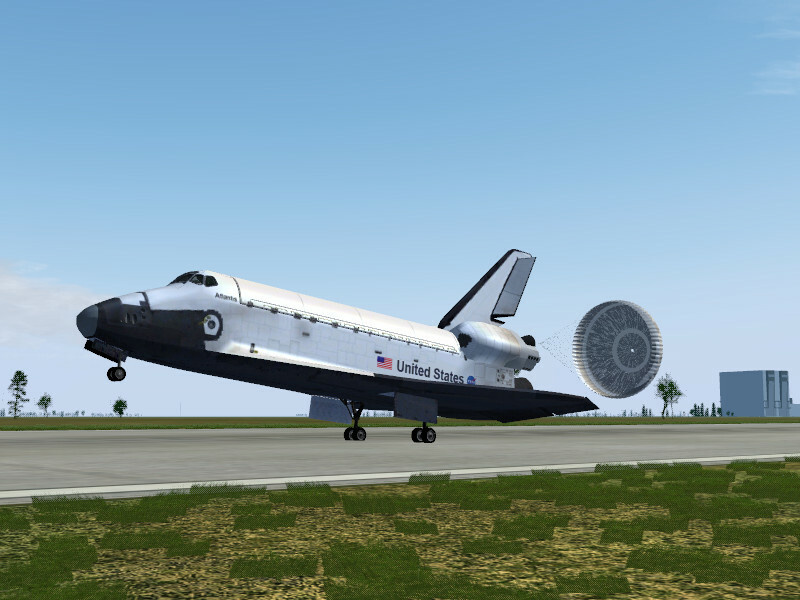 Thanks to the fact that virtually all material NASA has on the Shuttle is in public domain, the simulated flight dynamics and the resulting capabilities of the Shuttle are based on a large body of NASA wind-tunnel and actual mission data and hence highly realistic. For instance, the response to aerosurfaces is not only simulates as a function of surface deflection and dynamical pressure, but also as function of Mach number, AoA and the deflection of other surfaces, giving full account of the changing dynamics during entry, cross couplings between controls and non-linearities in the control response. 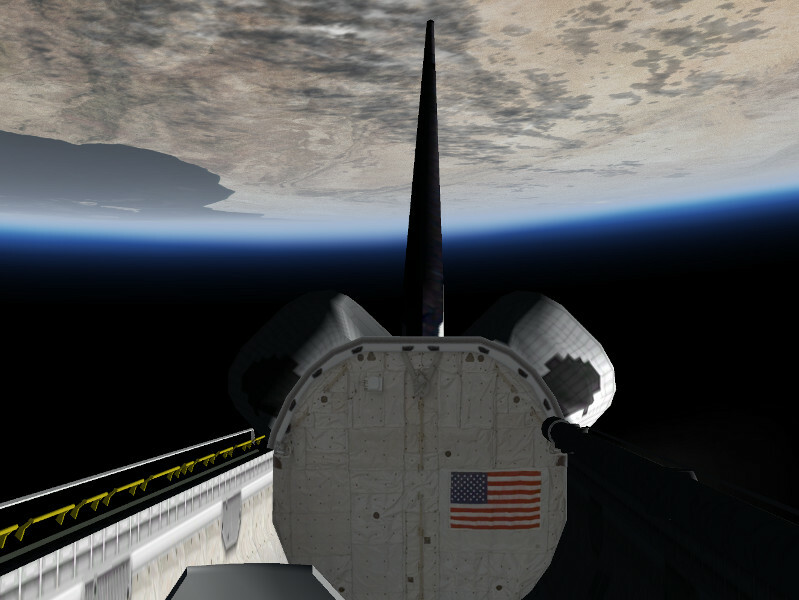 The Shuttle is under heavy development – the systems and avionics simulation is not quite on the same level of sophistication as the aerodynamics, but even in its present state, the full profile of a mission can be flown, including realistic entry guidance and support for abort modes such as RTLS (return to launch site). Even under rather off-nominal conditions such as an RTLS, the simulated Shuttle behaves as described in the crew operations manual, i.e. procedures can literally be flown ‘by the book’. For a bit more than eight minutes, the Space Shuttle is a true rocket ship, capable of a maximal acceleration above three g and highly maneuverable by thrust vectoring. During that time, it needs to reach a stable orbit. What’s little known is that aerodynamical stress is in fact much stronger during ascent than during entry – the dynamical pressure peaks at almost twice the value reached during entry about thirty seconds into the flight. This makes launch a busy phase – after liftoff from the pad, the Shuttle needs to be rolled to a launch course, than steered safely on a steep ascent path through the lower atmosphere before it finally levels off and races to orbital speed outside the atmosphere. 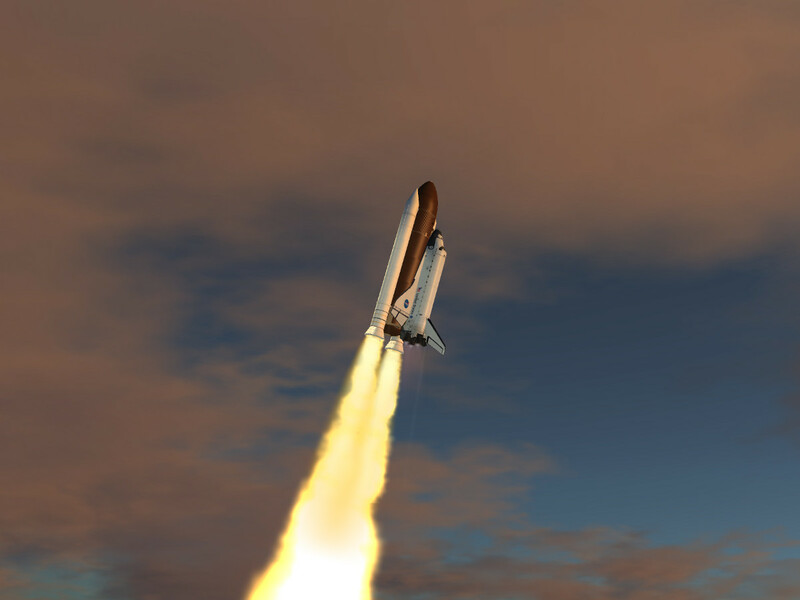 The simulation takes a lot of the structural limits of the Shuttle into account, so it’s quite important to steer the ascent trajectory through a safe region in order to avoid a catastrophic failure followed by an explosion of the external tank. We can’t really simulate the effect of weightlessness for the user in FG, but there’s a lot that can be simulated in space. 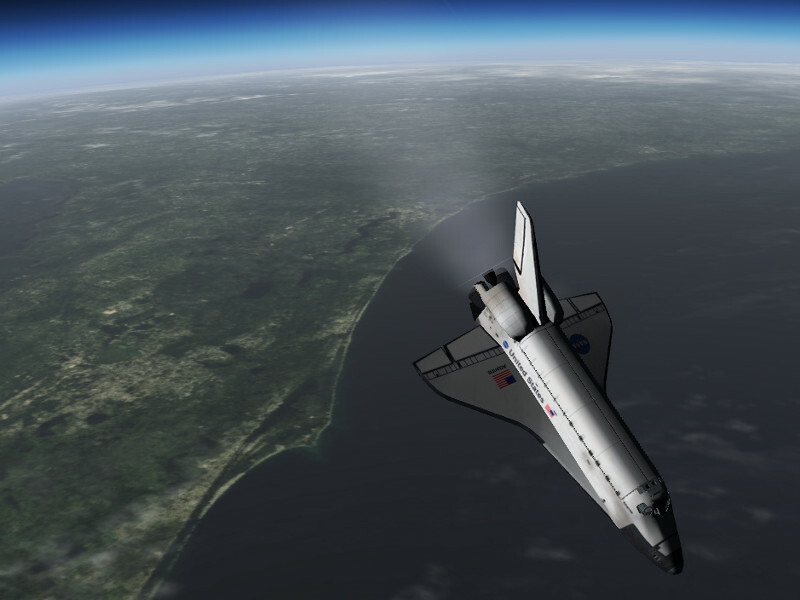 Once the main engines cut off, the flight characteristics of the Shuttle change drastically – it becomes a sluggish object which can just be nudged into slightly different attitudes or somewhat different orbits. 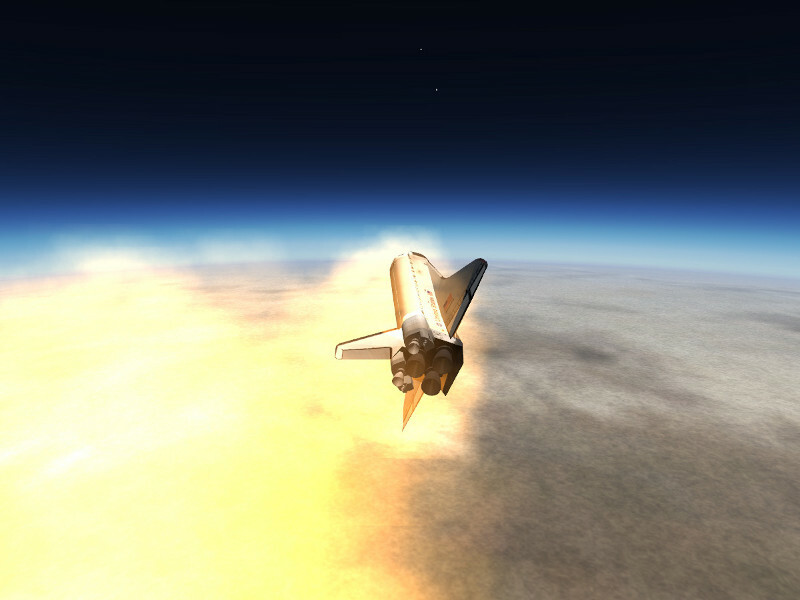 The Shuttle doesn’t need to be flown any more – once in orbit, it will stay there for a while even if you do nothing. Instead, it needs to be operated – its systems need to be activated for the space environment. 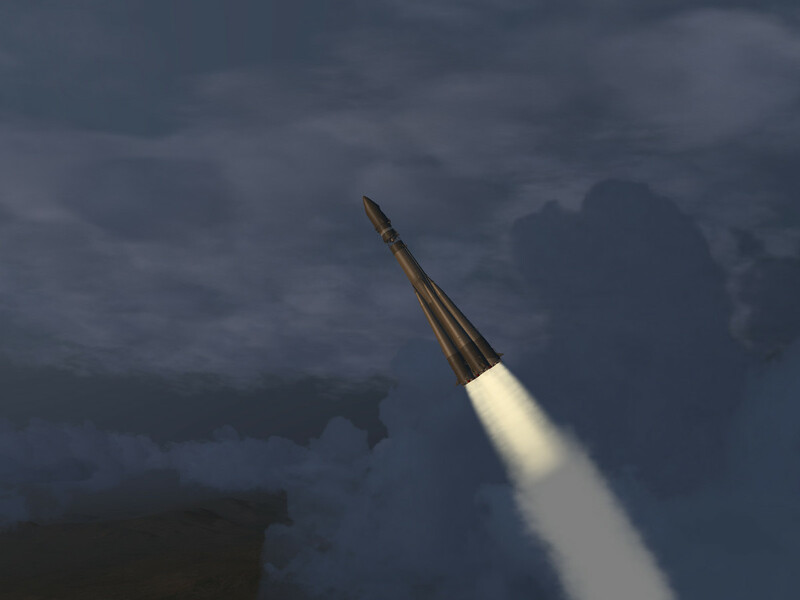 The simulation includes ready-for-orbit procedures like the propellant dump, umbilical door and start tracker door operation, payload bay door operation, Ku-band antenna deployment and pointing and thermal management. 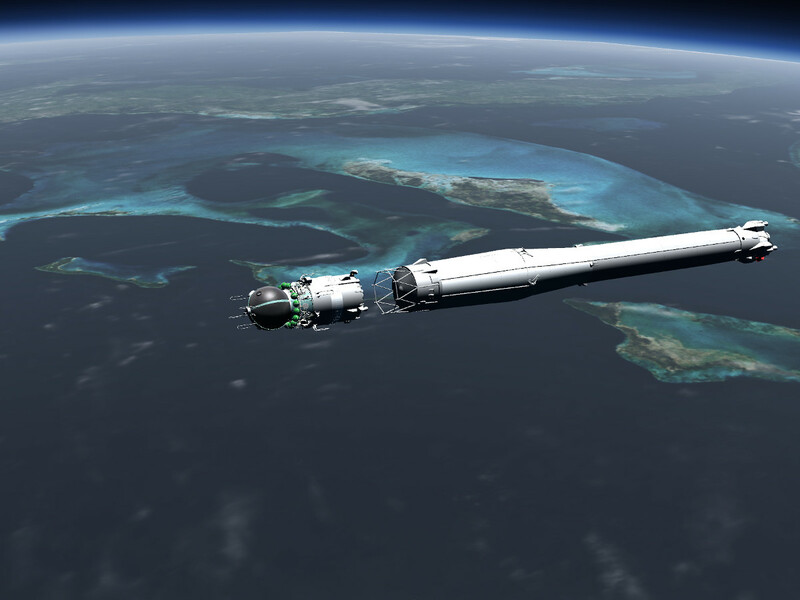 Also, the propellant flow of the orbital engines can be fully controlled, allowing procedures such as RCS to RCS, OMS to RCS or OMS to OMS crossfeed. 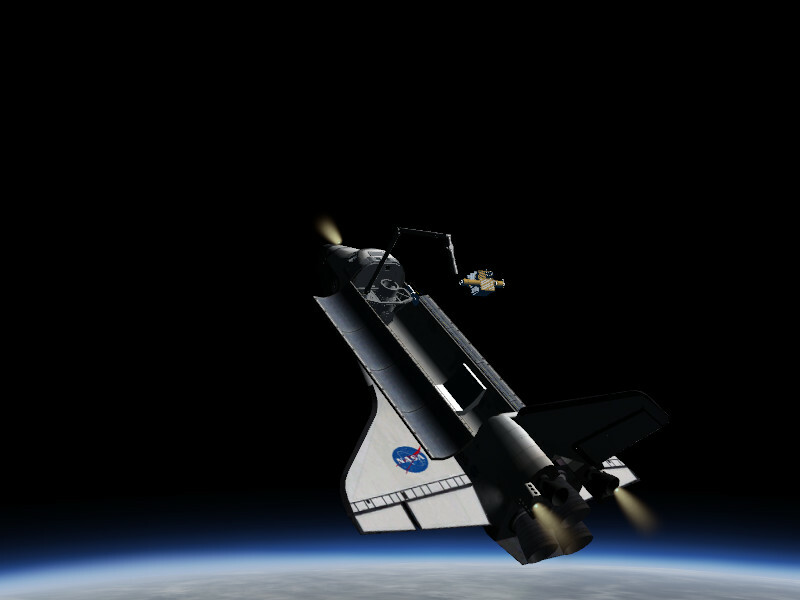 There is in fact a complete simulation of the thermal environment running, including radiation fluxes from Sun and Earth, heat radiated into space, heat conduction between different parts of the Shuttle, equipment as sources of additional heat and flash evaporators, spray boilers and radiator as heat sinks connected to the freon cooling loop. In order to keep the Shuttle operational, you need to do heat management by operating the radiator and bringing the Shuttle into a good attitude relative to the Sun. Also, heating elements need to be used to keep thrusters from freezing up. The flight characteristics of the Shuttle changes drastically from mission phase to mission phase. Over the course of a mission, controls change from thrust vectoring of main engines and boosters via the reaction control system (RCS) thrusters and thrust vectoring of the orbital maneuvering system (OMS) engines to airfoils for the final glide through the atmosphere. A host of digital autopilots (DAPs) connects the control inputs with the various ways to control the Shuttle. In orbit, they are augmented by extra functions – there’s inertial and local horizon attitude holding modes, rate controlled moves, pulsed modes, the low thrust Vernier engines for fine attitude control – and practically all aspects of the DAPs are configurable during the mission. 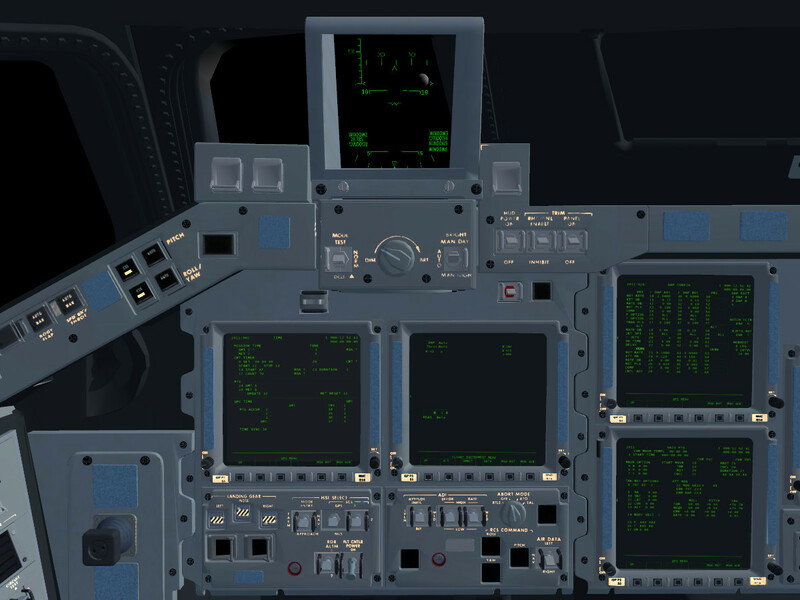 The need to support all these different modes makes the flight control system of the Shuttle easily the most complex of all Flightgear aircraft. 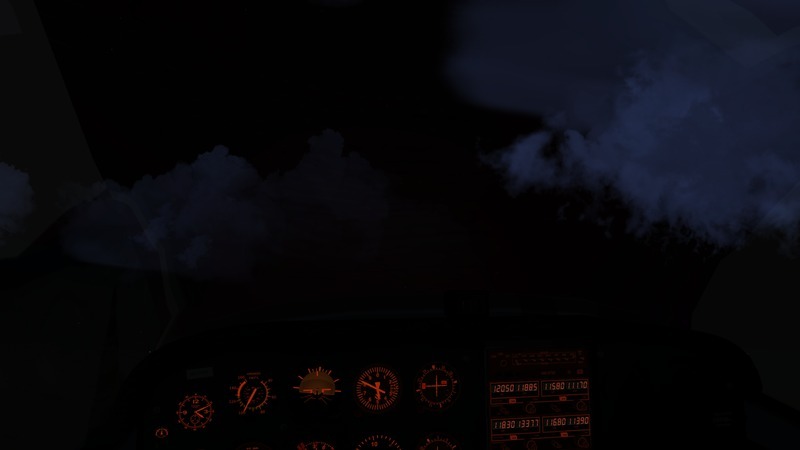 Often the question comes up whether Flightgear as a flight simulation is any good in simulating spaceflight. 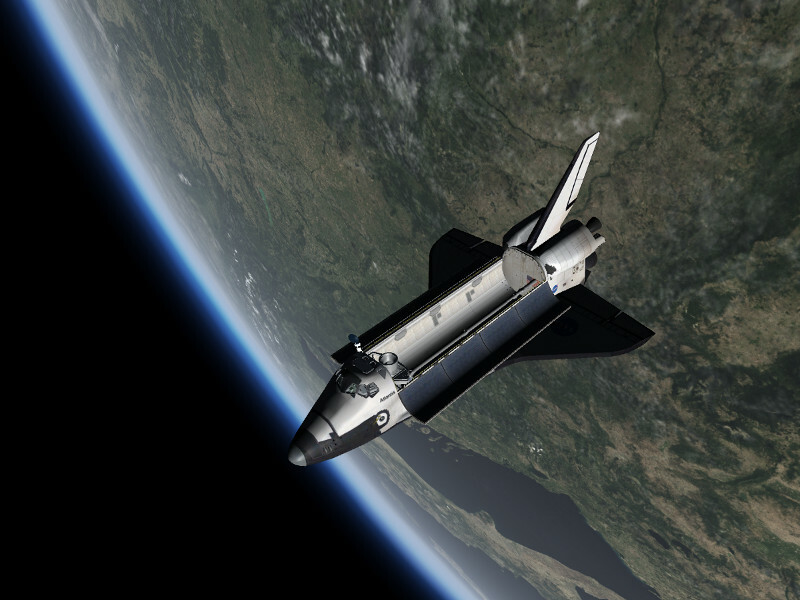 It turns out that the flight dynamics solver underlying the Space Shuttle, JSBSim, is quite capable of orbital dynamics, in fact it has been benchmarked against several test cases in a 6-DoF simulation code comparison by NASA. JSBSim simulates Earth not as a point mass but as a true realistic mass distribution, and there’s even a simulation of differential gravity – the distance from Earth to the upper edge of the Shuttle is slightly larger than the distance to the lower edge, and that corresponds to a tiny residual force which acts like a torque on the Shuttle. So never believe for a moment that the dynamics of the Shuttle in orbit is simplified or arcade-like because FG is a flightsim – it is not – it is in fact realistic down to effects you never really thought of. 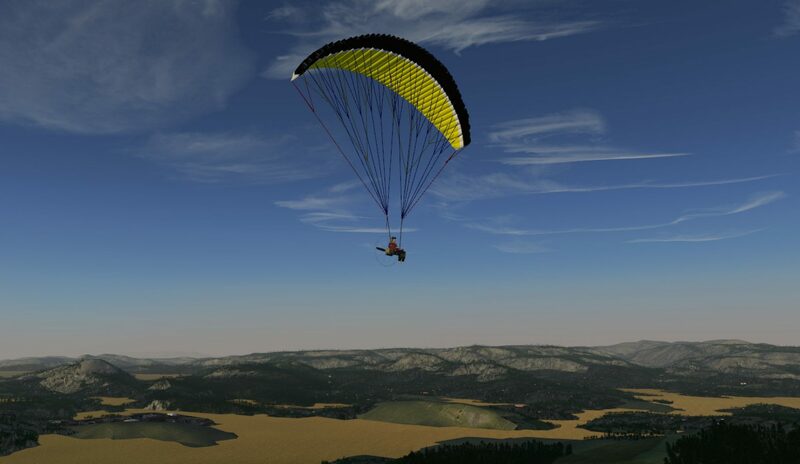 JSBSim is not a game engine, it is a professional simulation code that just happens to be OpenSource. The Shuttle includes a detailed simulation of the remote manipulator system (RMS) arm operation – the arm can be driven in various modes, grab a payload from the bay and release it into space after it has been unlatched. In addition, there is a simple spacewalk view which allows to step out of the Shuttle and float around, using small thrusters, in essence simulating the operation of a manned maneuvering unit. 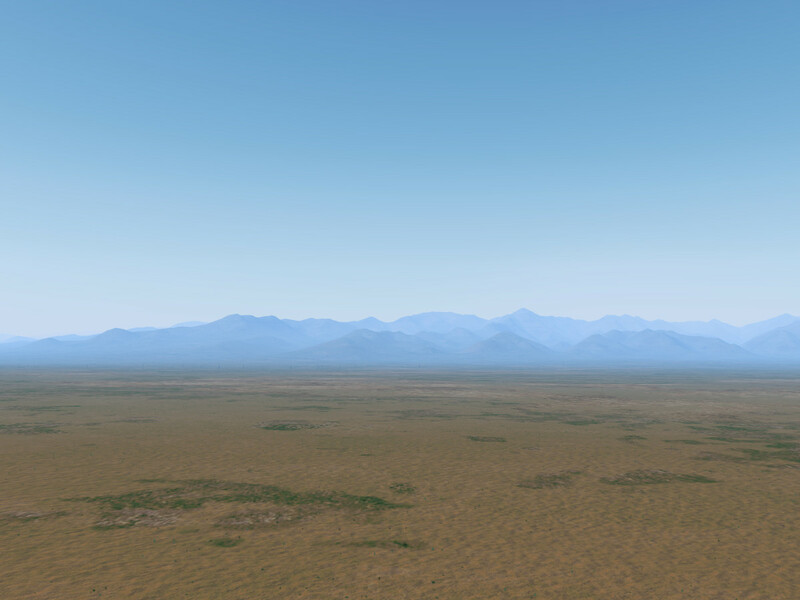 The default Flightgear terrain rendering engine is not optimal for views from high altitude – in fact, it will be hard-pressed to show anything from a 300 mile orbit. 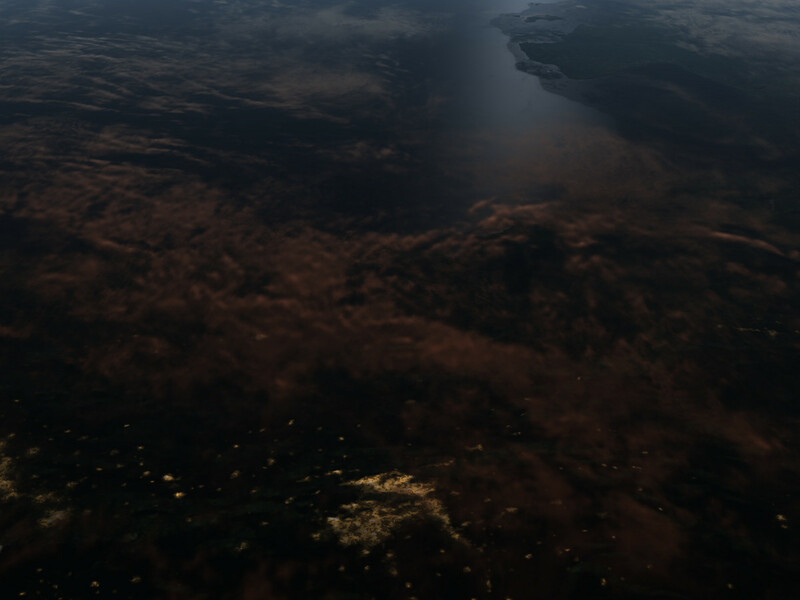 Instead, FG comes with the Earthview orbital rendering engine which can be used from some 80.000 ft and above and displays the planet as a textured sphere. 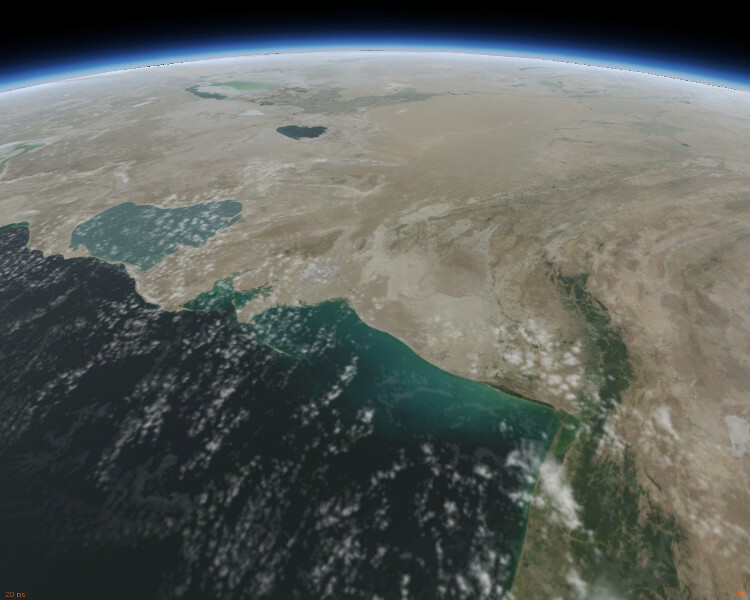 Earthview is fairly sophisticated and renders even correctly placed cloud shadows if a cloud sphere is used. However, in a default FG installation, only relatively low resolution textures are shipped (which can be procedurally enhanced) – not really enough for photorealistic impressions. More detailed textures can be obtained from the NASA visible Earth page – for the visuals used here, the maximum resolution available has been used – individual texture sheets are 16384×16384 pixels large. 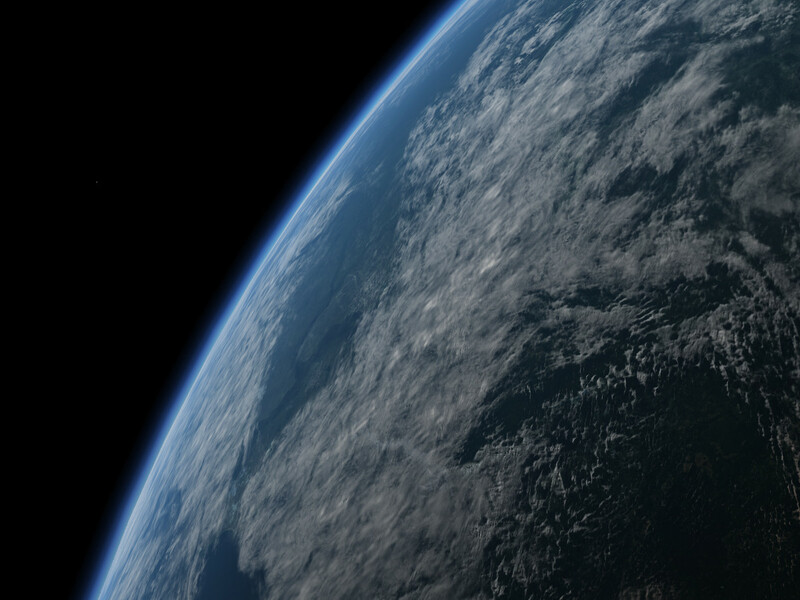 At this resolution and converted to dds to allow fast loading, the Earth textures are about 2 GB – which would triple the size of the FG repository – which is the reason they’re not available as default option. 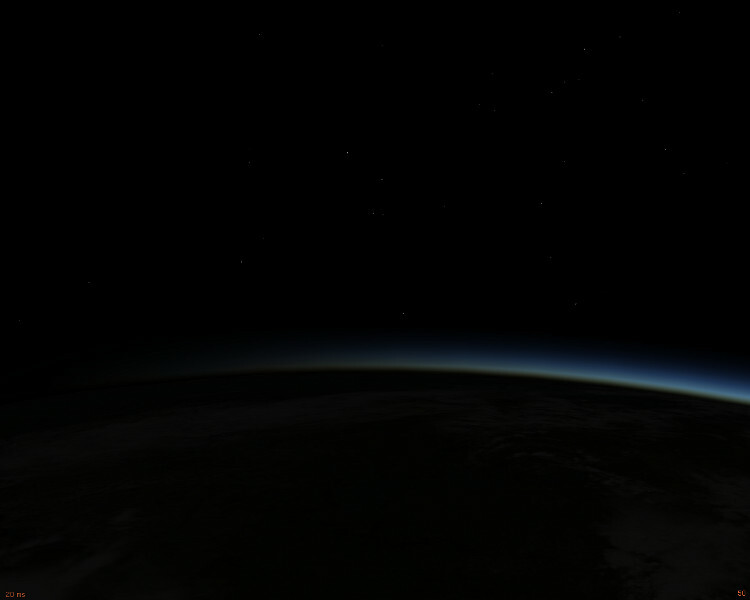 Also the atmosphere contributes much to the view from orbit. 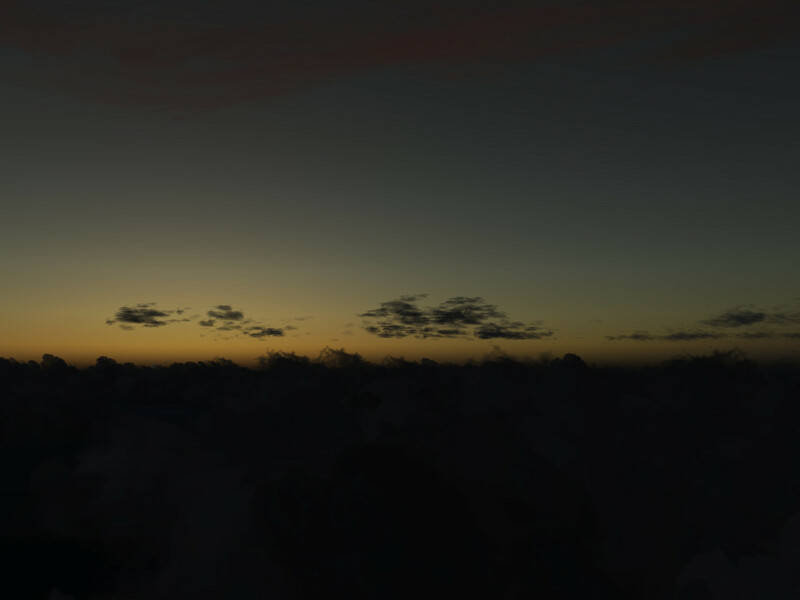 Currently only one of the three rendering schemes available in Flightgear (Atmospheric Light Scattering) generates compelling visuals of the upper atmosphere, the other two (Rembrandt and default) do no. 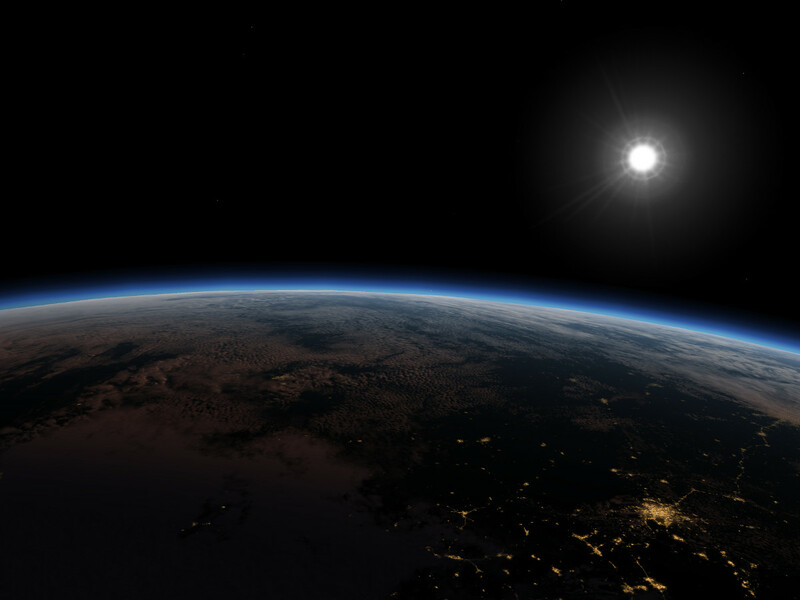 Due to the lack of an atmosphere, lighting in space is fairly hard – there is little light on surfaces not facing the sun. 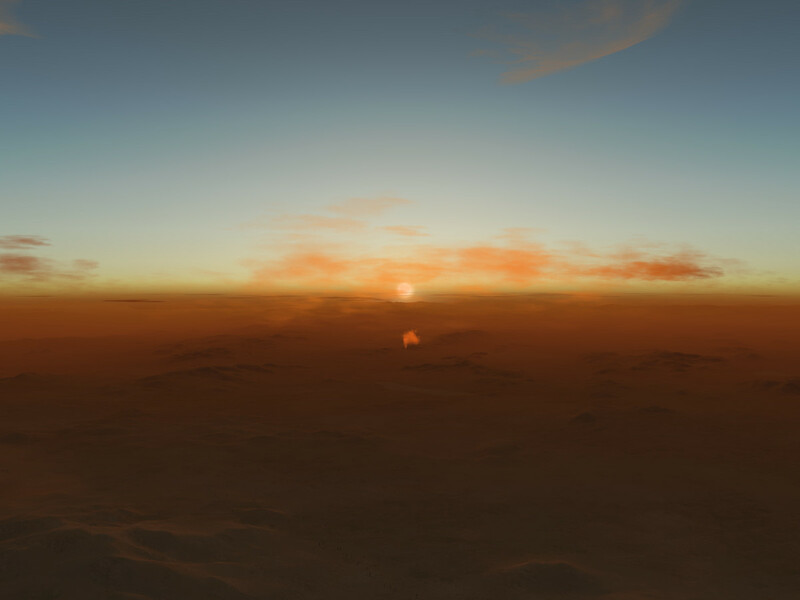 Dedicated GLSL shaders specifically written for space flight manage this transition from the lower to the upper atmosphere. There’s (literally) hundreds of switches and gauges in the cockpit of the Space Shuttle. At present, only a small fraction of them is fully functional and animated, although many are already part of the internal systems simulation. The following screenshots are intended to provide an impression of what final result we’re aiming at. The data processing system (DPS) of the Shuttle is controlled via keypads on the central console. Extra switches are used to select which screen a given keypad is currently talking to. With all screens in the cockpit used, the Space Shuttle can show an unbelievable amount of information at the same time. 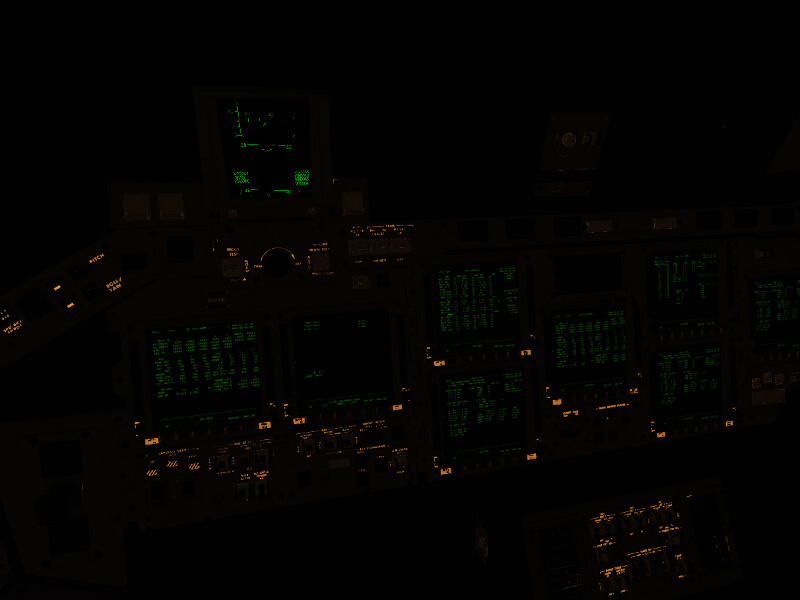 At night, the simulation includes the backlighting of instruments, casting a diffuse glow onto the cockpit interior. The data processing system (DPS) of the Space Shuttle was groundbreaking when it was introduced, but looks definitely odd when compared with modern computers. The memory of the computers actually is not large enough to hold the programs for all mission phases at once, hence there is the need to transit between different operational sequences during a mission. 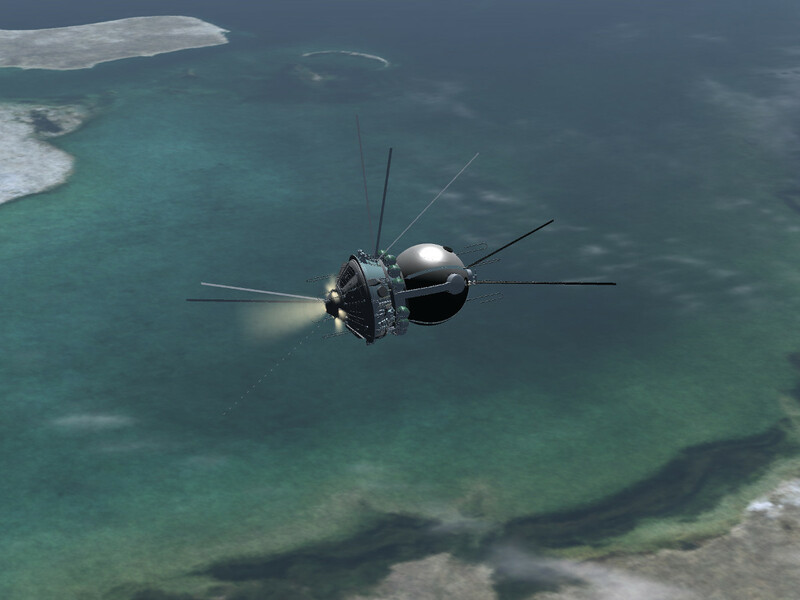 Interaction with the spacecraft is simulated as in reality. It requires to type short instructions sequences such as OPS 201 PRO or ITEM 7 + 4.1 EXEC on a keypad which triggers the appropriate functions. 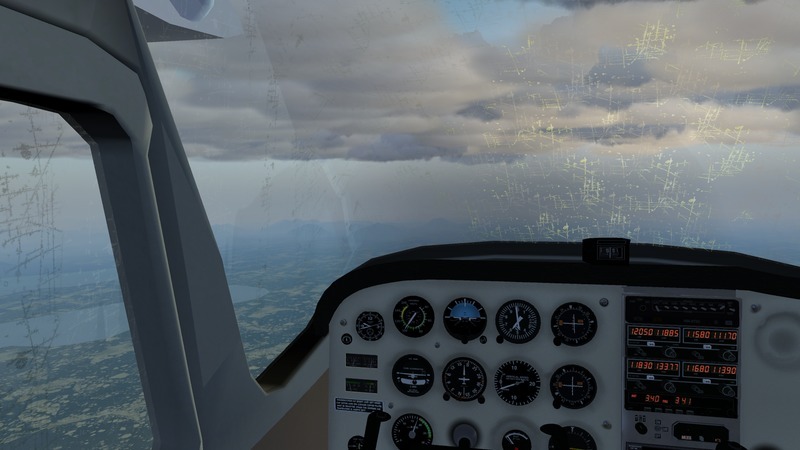 Since the avionics is fairly complex, some learning curve is required to operate it properly, but there are multiple rewards for the patient user. 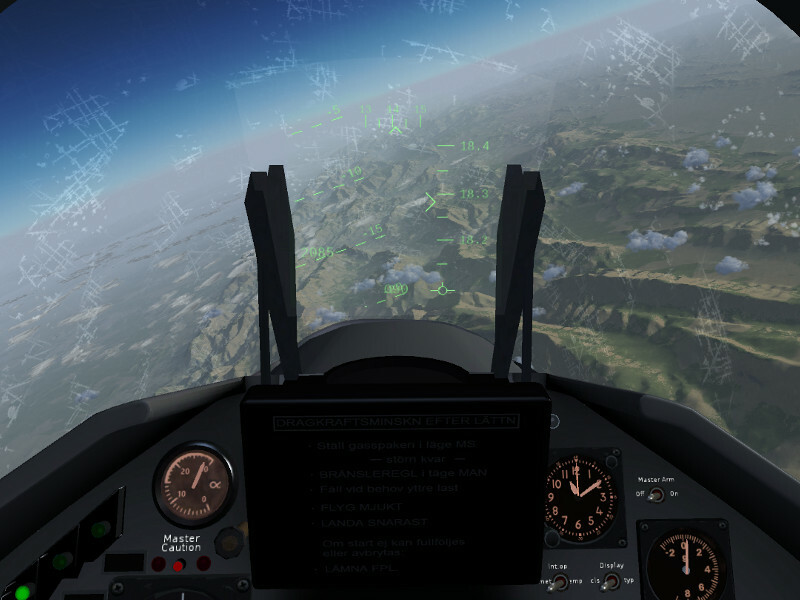 The Flightgear Space Shuttle is capable of numerous automatically controlled operations – it is possible to do an automatic orbital insertion or deorbit burn by entering PEG-7 targets, there are inertial pointing routines, tracking routines to keep the Shuttle pointed towards a certain celestial body or towards Earth or automatic thermal management routines. Using the systems management software, one can in detail follow the operations of APUs, the RCS and OMS engines or the payload bay doors, override failed hardware switches, initiate emergency fuel dumps, re-configure the digital autopilots or control the antenna. Finally, the avionics provides the original guidance and navigation tools for atmospheric entry, in particular the ranging during the aerobraking phase and the final TAEM phase. From a piloting point of view, the entry phase is by far the most interesting. Here, the transition from a spacecraft on a ballistic trajectory in vacuum to an aircraft that glides through the lower atmosphere towards the runway takes place. 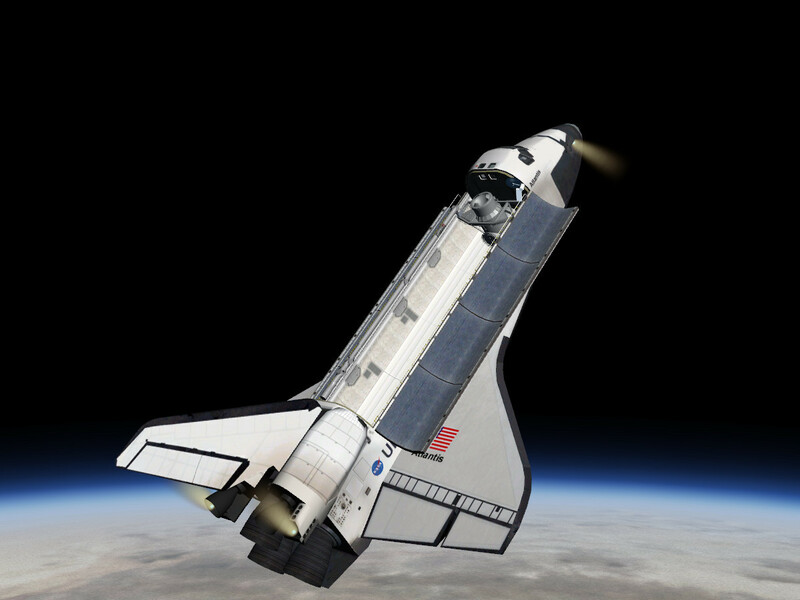 While at the beginning of the entry, the Shuttle is completely controlled by RCS thrusters, in the end it is fully flown by airfoils like a plane. In-between is a hypersonic phase in which the Shuttle has aerodynamical lift and flies, but is controlled very differently from an aircraft. As in reality, the simulation provides automatic helpers for trajectory management. In particular, an AoA auto-hold can be activated to help keeping the Shuttle in a thermally safe regime, and the rate-controlled DAP makes the Shuttle respond crisply and controlled to each input, regardless of whether in near-vacuum, in hypersonic descent at Mach 16 or in the lower atmosphere at Mach 2. In fact, while the Shuttle is yaw unstable and needs to be constantly nudged back to zero sideslip, you’d be hard-pressed to observe any trace of this. In fact, the controls feel almost arcade-like. However, if you’re up for a challenge, you can use a different DAP (for purely educational purpose) which lets you control airfoils directly – and then you’ll feel directly just how much the conditions change from Mach 24 down to Mach 2. Landing the Shuttle is quite different from landing an airliner. With its hypersonic outline, the Shuttle has the aerodynamics of a brick. It plummets down with 10.000 ft/min, has a glidepath on final of 15-17 degrees and aims for a touchdown at 214 kt – quite a bit higher than for most aircraft. 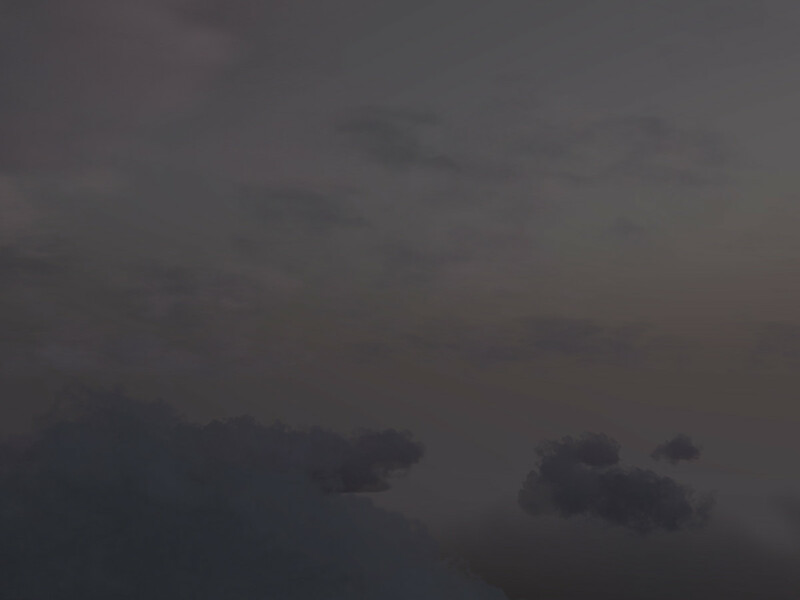 Yet, for these final few minutes, it is possible to exploit Flightgear’s strength to the full – try any weather or visibility and see whether you can still make the approach. But always remember – there’s just one chance. And one thing is certain – you’ll never forget your first descebt from orbit right down onto a runway. A flight-tested version is kept on the FGAddon repository. For this version, someone has made sure that all mission phases can in fact be flown without triggering a bug. This version typically lags behind the current development. The current development version is kept in its own repository. It contains all the most recent features but is not flight-tested, i.e. simply may not work as expected. 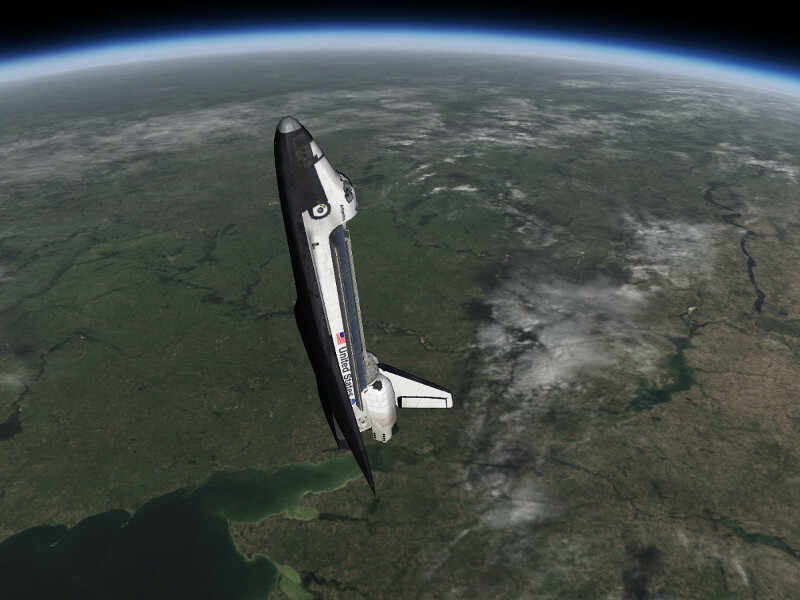 The Shuttle will also be part of the next FG stable release – currently forseen in late winter/early spring 2016. If you’re interested in contributing to one of the most fascinating spacecraft, you’re more than welcome. Ranging from texture art to 3d modeling of payloads and site-specific buildings (think Kennedy Space Center), from data-gathering to refining the aerodynamics and avionics, there’s lots of things that can be done. You can always get in touch via the Shuttle’s forum thread – or via the devel repository. All quotes describing the Space Shuttle experience are from the astronauts, taken from the book Space Shuttle: The First 20 Years (DK Publishing). 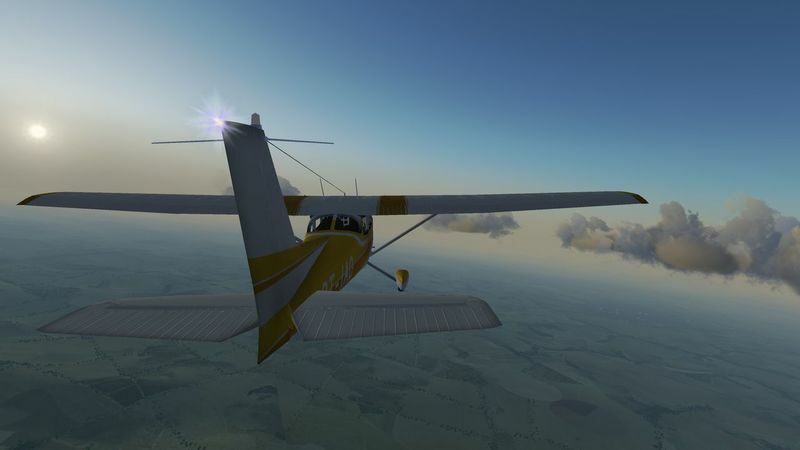 FlightGear’s default aircraft, the Cessna 172P, went through a major makeover. This post will show some of these improvements. 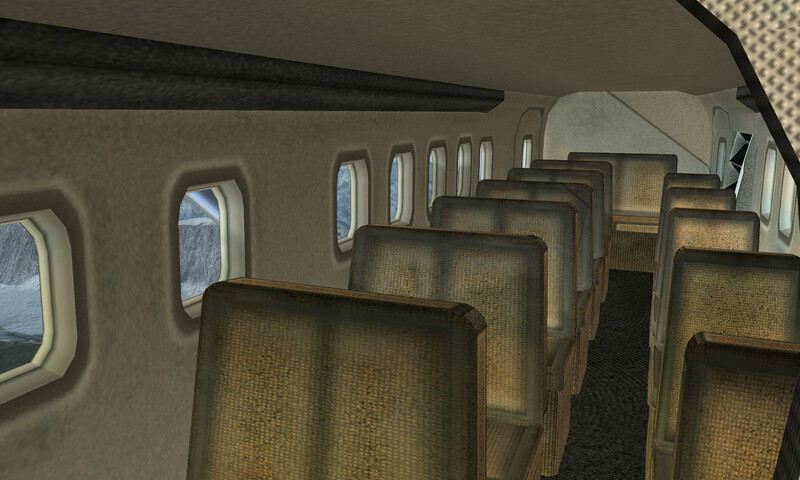 The aircraft exterior is now much more detailed, with new higher resolution liveries (as well as several cockpit and interior themes). The cockpit is now fully textured and fully functional. 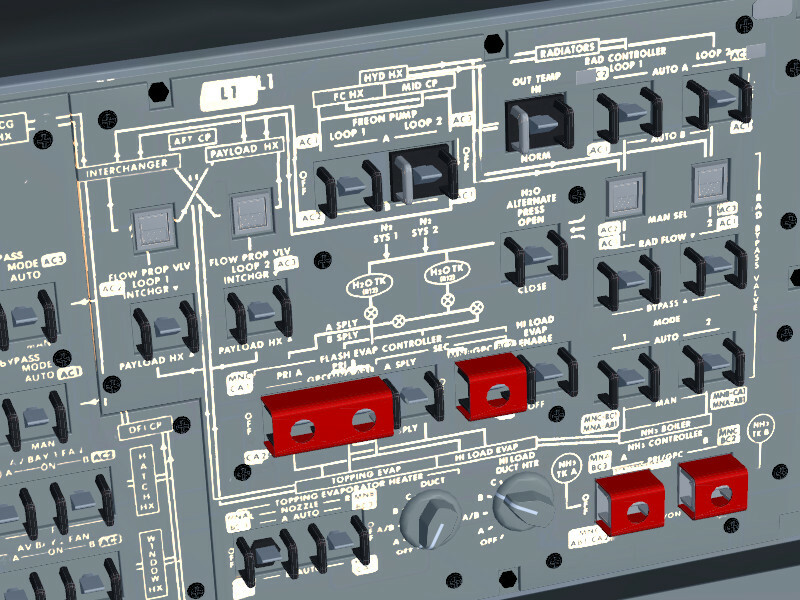 All switches, buttons and levers are operable (try pulling out some circuit breakers!). When using ALS, the new interior shadow effect is very immersive. There are six variants avilable now (default, two bush tire variants, amphibian, pontoon and skis) as well as two types of engine (160 HP and 180 HP). Below, the amphibian variant at San Francisco bay. The cockpit has now a glass effect, making the windows reflective. The instruments can also be illuminated if the sunlight is getting weak. 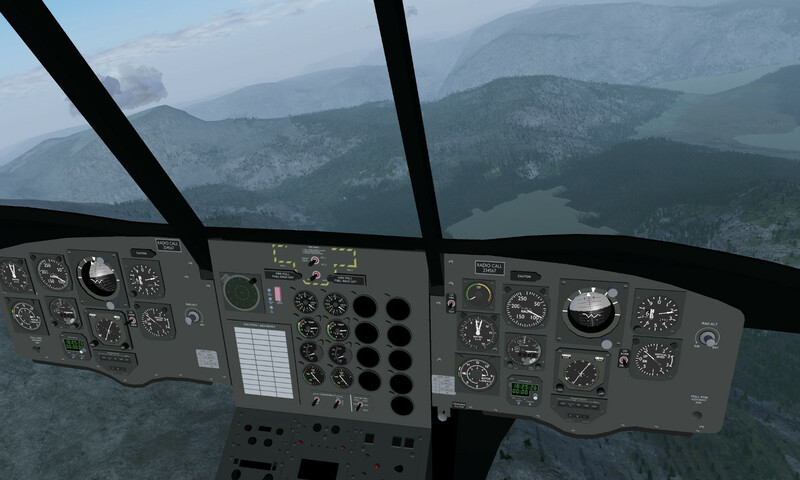 If the conditions are just right, the cockpit glass will get foggy or display some frost, as in the image below. To control that, use the air vent and air heat levers (as well as cracking the windows!). Pre-flight inspection has now been implemented. It’s possible now to add and remove tie-downs, wheel chocks and the pitot tube cover. On top of that, one has to keep an eye for the oil level and possible fuel contamination. The plane has a tutorial explaining how all these new features work. The aircraft can now get damaged. Land too hard and the front wheel will collapse; dive and pull the yoke at once and the wings will break. But there is no need to worry if your plane gets damaged: a repair button has been added to the aircraft menu. 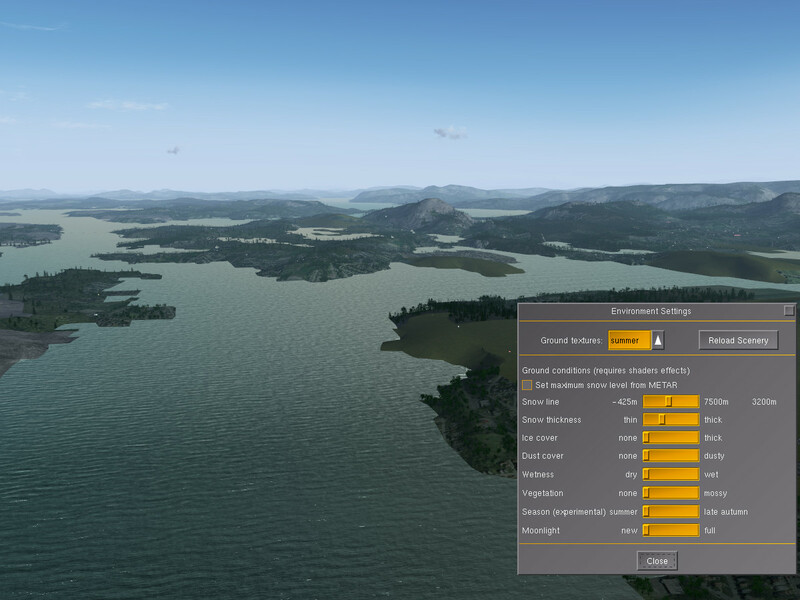 Regarding sounds, some major improvements have been done: these include not only new cockpit sounds (switches, levers) but also environment sounds: water sounds for the amphibian and pontoon variants, new wind, rain and thunder sounds for all of them. The aircraft comes with two flashlights (one white, one red) for night flights, allowing one to start the plane from cold and dark regardless of the amount of sunlight. Among other improvements, we have now a better flight dynamics model, with better stall and spin behaviour, and new hydrodynamics for the float variations. If you run the FG development version and want to track the latest developments for this plane, you can find the development repository here. There is also a forum thread for discussion and feedback. If you look at aerial imagery of a region every day for a year, it never changes. Yet if you would fly over the same region in reality every day, it would almost never look the same twice. In reality, nature is a dynamically changing environment, and what you see from a cockpit reflects this. 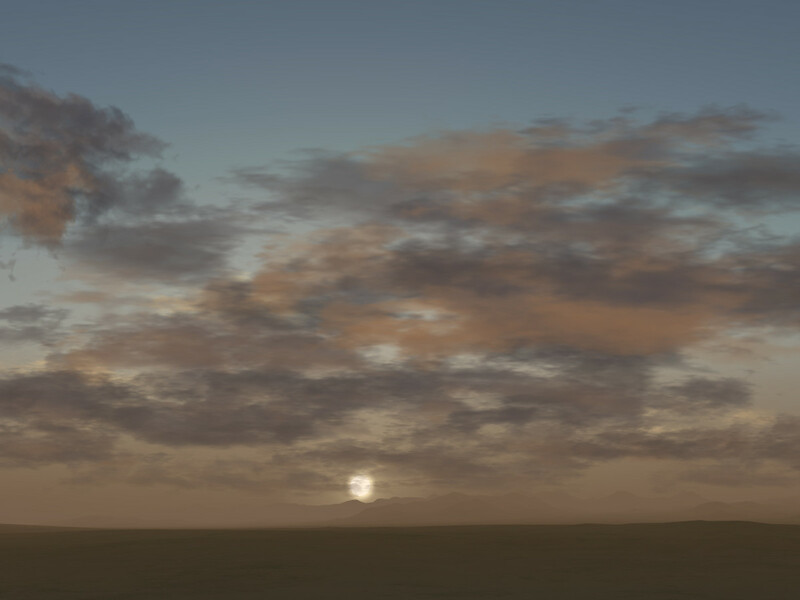 Some of these changes have to do with weather – on a cloudy day, the light is different from bright sun, the shadows are muted, the amount of haze may change so that faraway terrain looks fainter… and these are readily captured by the weather simulation. Yet there are more subtle effects. For instance, snow may linger on the ground even on a sunny day with temperatures above freezing if the original layer was thick enough. Snow may fall, but not remain on the ground if the ground is warm enough. In essence, whether you see snow or not depends not so much on how the weather is now, but how it has been the last days, weeks or even months. 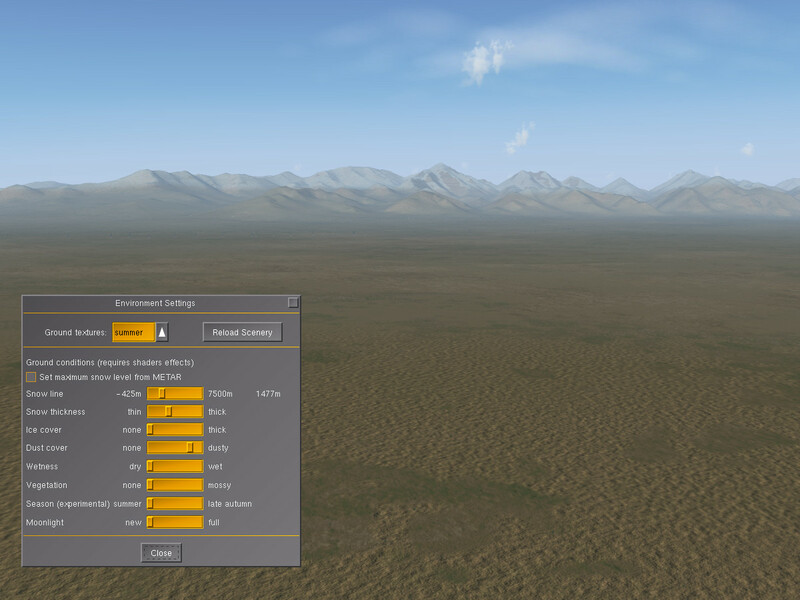 Such changes to the scenery in FG are taken care of by the environment settings which control how the terrain is shown. You can find the menu as an entry under Environment. 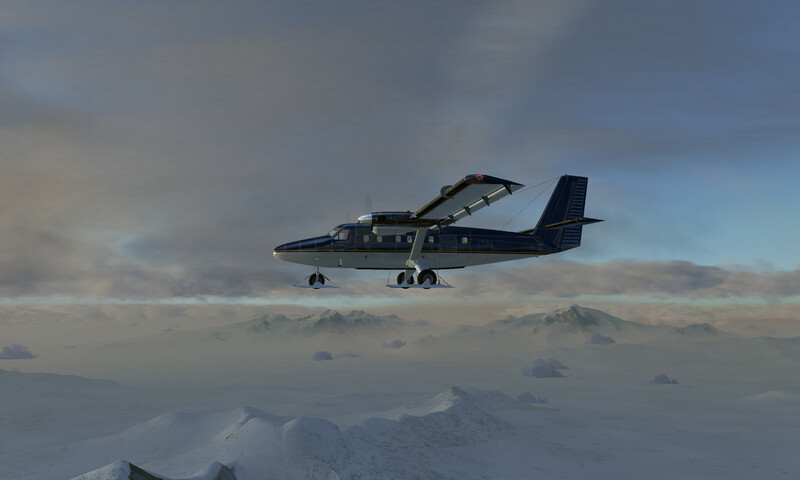 Currently, the full range of environment effects is only implemented for the Atmospheric Light Scattering (ALS) framework starting from medium quality settings, however the snow effect is available for all rendering frameworks. 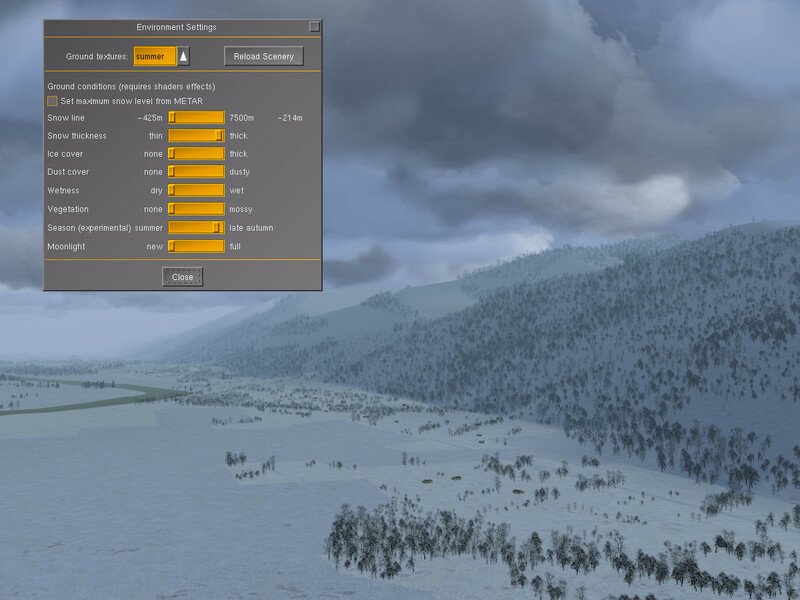 Using a combination of the season and snow settings, it is hence possible to simulate a lot of the seasonal changes during the year. But that’s not all. Why can’t this happen automatically? The environment subsystem just renders as it is told, it is hence easy to misuse it – think snowfall and ice cover on Caribbean islands for instance. Sometimes, the question gets asked why this is implemented that way, and why parameters aren’t just set automatically. The answer to that is – based on what should they be set? 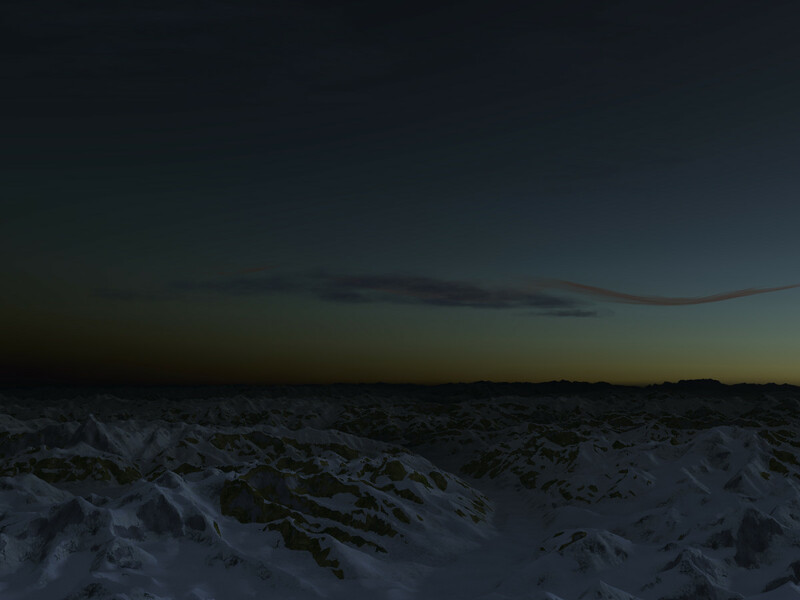 Flightgear does not include a global climate simulation as would be needed to determine how likely it was that there was e.g. snowfall during the last days or weeks, or that there was a dry summer and hence everything should look dusty. 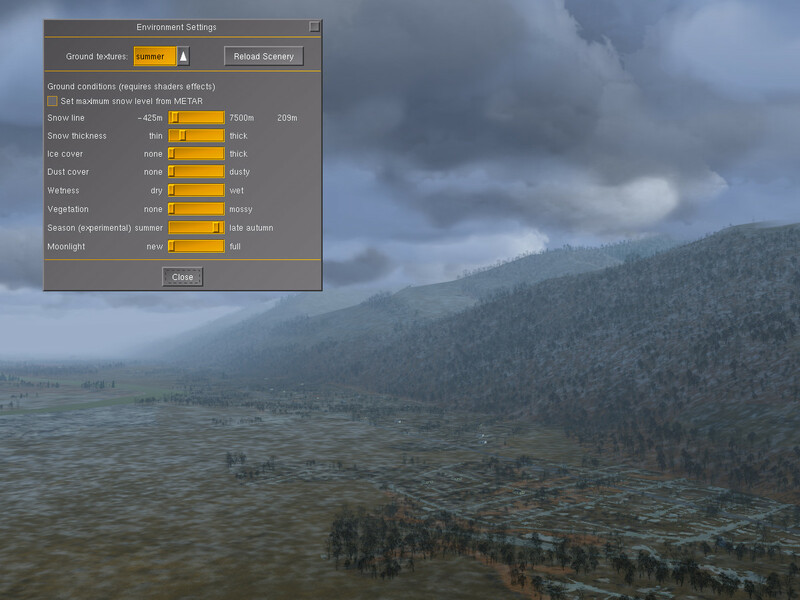 The idea is that the user can adjust these settings, either based on how the scene currently looks at a location, or based on what the user wants to experience (it’s a simulation after all – there’s nothing wrong with simulating a tropical day in Hawaii on a bleak winter day). If used with some care, the environment settings offer a chance to experience the same scenery in a hundred different ways, each time subtly different. If misused, the settings deliver weird to crazy results of course. 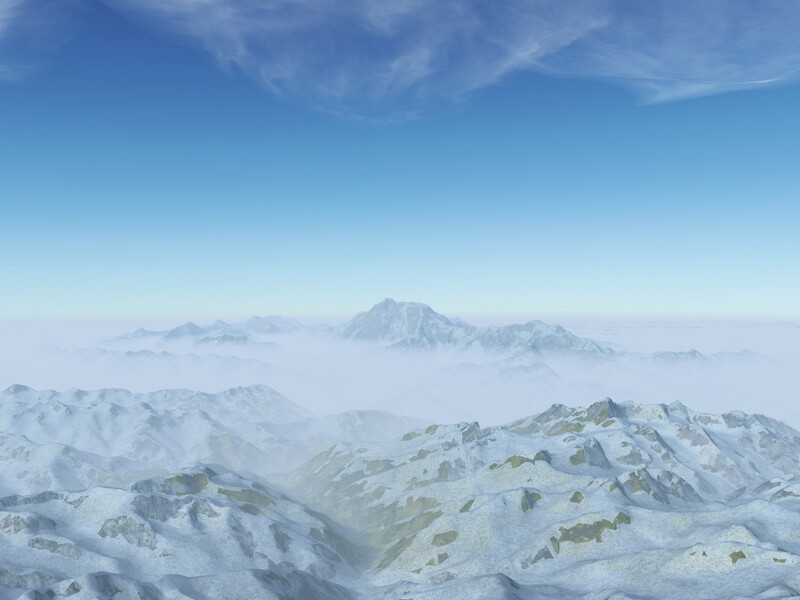 For the sake of completeness, for low-performance systems which are unable to run shader effects, using the commandline option –season=winter offers at least the choice between the default summer textures and a snow-covered set of textures, although no control over snowline and thickness. Have you ever admired the beautiful colors of a sunset? Have you maybe wondered why sometimes sunsets show a fantastic palette of glowing red and golden colors in the sky and sometimes a rather muted blue-grey? Have you observed distant hills fade into blue haze while the glittering reflection of the sun on water shifts color to a yellow-orange and asked yourself where the difference comes from? Have you wondered why there’s sometimes a halo visible around the moon? All these phenomena and more are related to light scattering in the atmosphere. Actually, most of what we see looking out of a cockpit from 36.000 ft is not scenery but light scattered somewhere on haze, clouds or air molecules. 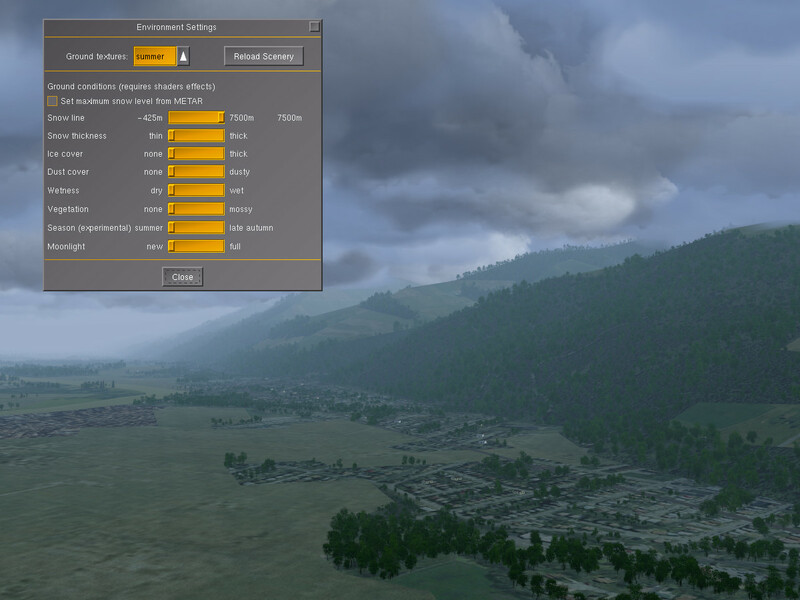 To create a realistic impression of a scene during flight, we can’t think of haze being something simple that obscures the scene, instead we have to invest as much attention to rendering haze properly as to the more prominent scene elements. 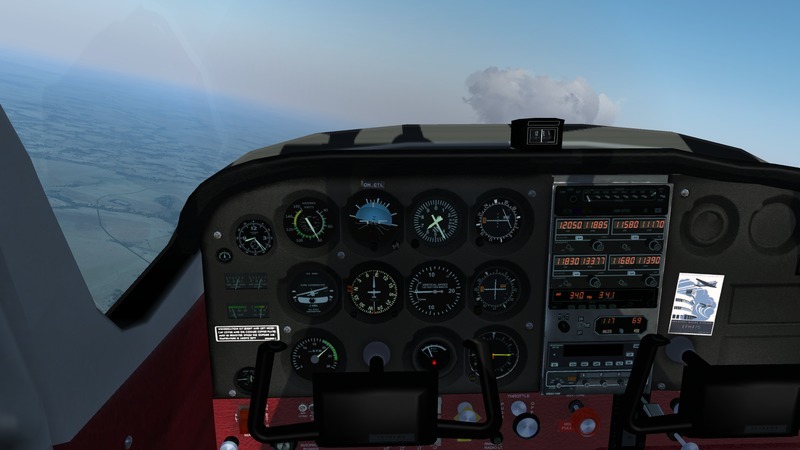 In Flightgear, that’s what the ALS framework is doing. To first approximation, the normal lighting situation of a scene during daytime is that the sun is high in the sky and illuminates an object, from which reflected sunlight falls into the eye. There are thus two light rays – the illumination ray (I-ray) goes from the sun to the object and the observation ray (O-ray) from object to the eye. In vacuum, that’s all there is to it, and pictures from the surface of the Moon illustrate this – objects remain visible no matter how far away, and any surface which is not in direct light is pitch black. In an atmosphere, light scattering can affect both the I-ray and the O-ray, and there can be in-scattering and out-scattering. In-scattering corresponds to light from somewhere else in the scene being scattered onto the object (or into the eye), out-scattering corresponds to light from the sun being scattered away from the object or light from the object being scattered away from the eye. I-ray in-scattering causes ambient (non-directional) light – shadows are no longer pitch black but receive still some kind of illumination. 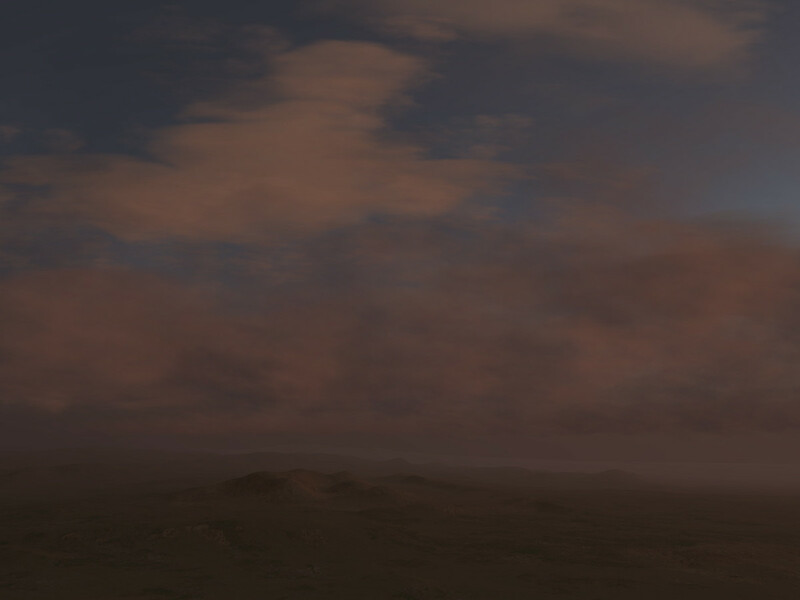 Under a thin overcast haze layer, there is for instance strong I-ray in-scattering – while there is lots of light available, it comes from almost everywhere in the sky and no shadows are cast onto the ground. 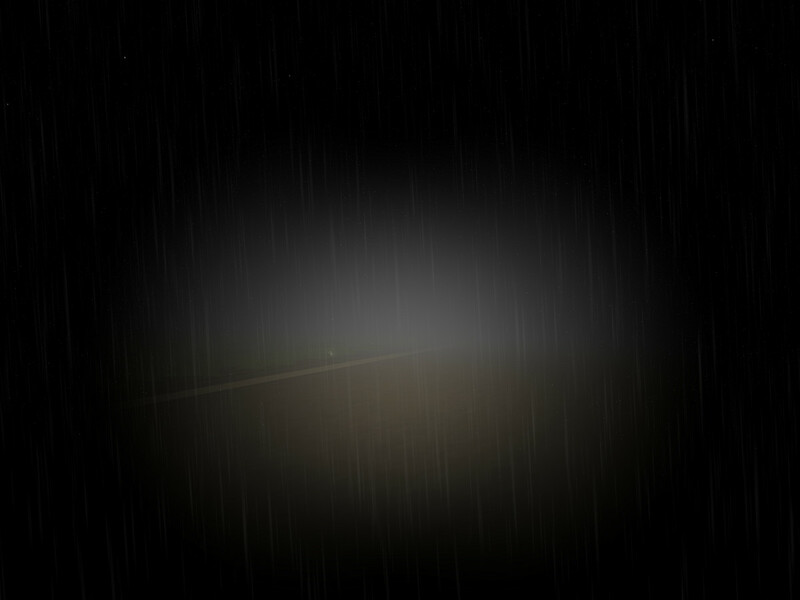 O-ray in- and out-scattering both cause objects being shrouded by haze, but in-scattering causes a bright haze, out-scattering a dark haze effect. To complicate matters, there are three basic physical scattering mechanisms which can take place: Rayleigh, Mie and diffuse scattering. * Rayleigh scattering occurs on very small particles – the air molecules themselves or fine dust (‘dry haze‘). It has no preferred direction, but is much stronger for blue light than for red light. * Mie scattering occurs on larger particles – usually water droplets (‘wet haze‘). It has no color dependence, but is much stronger at small angles than at large angles, i.e. Mie-scattered light almost keeps its original direction. * diffuse scattering isn’t really a distinct elementary process but the effect of multiple scattering processes over which direction and color specific dependence is blurred, hence diffuse scattering has no color or directional dependence. Any real scene is hence a mixture of Rayleigh, Mie and diffuse in- and out-scattering on O-ray and I-ray (which makes for a total of 12 scattering channels, out of which 11 are modeled in at least some approximation by ALS – only Mie in-scattering on the I-ray is not considered since it is not very important in practice). Since most flight-relevant fog is wet haze, in FG the amount of wet haze is directly linked to the reported visibility. In many weather situations, fog is densest in the lowest convective air layer and the air is much cleaner above. 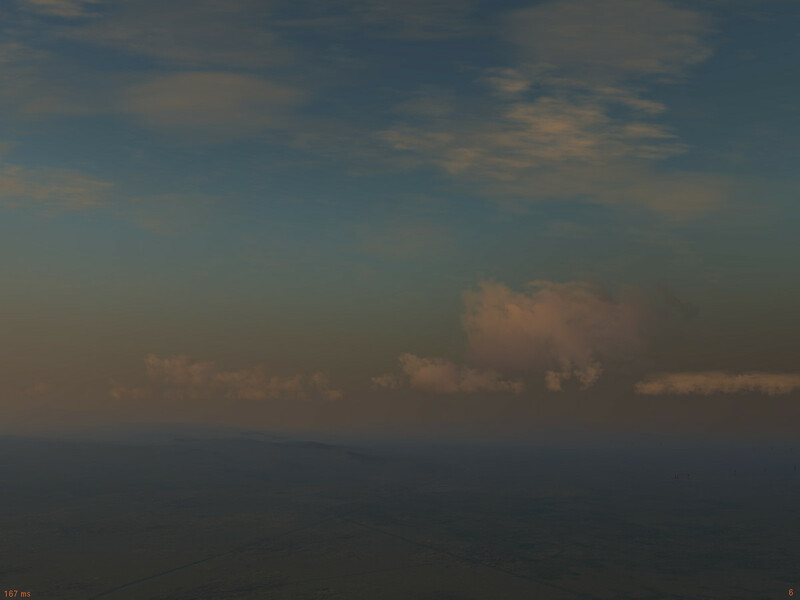 ALS hence allows to render a lower layer of volumetric fog in addition to much less dense haze in the upper atmosphere. Seen from above (as in the scene showing morning fog at the foothills of Nanga Parbat), wet haze appears a bright white during the day, but when entering the fog, its color gradually changes to a dark blue-grey as diffuse out-scattering blocks the light. During the day, the I-ray is typically much shorter than the O-ray because the sunlight crosses the atmosphere vertically. The density of the atmosphere is variable in altitude, but effectively the whole vertical extent correspondsto a length of perhaps 10 km, whereas on a clear day objects 200 km distant can easily be seen. This is why Rayleigh out-scattering for the incoming light is not dominant while the sun is high. 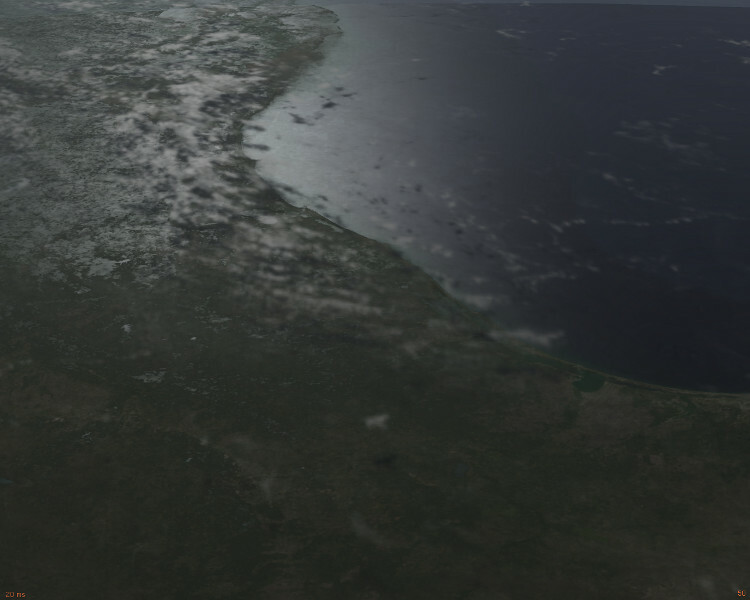 The following screenshots have been rendered with the EarthView orbital rendering option of FG in combination with ALS. 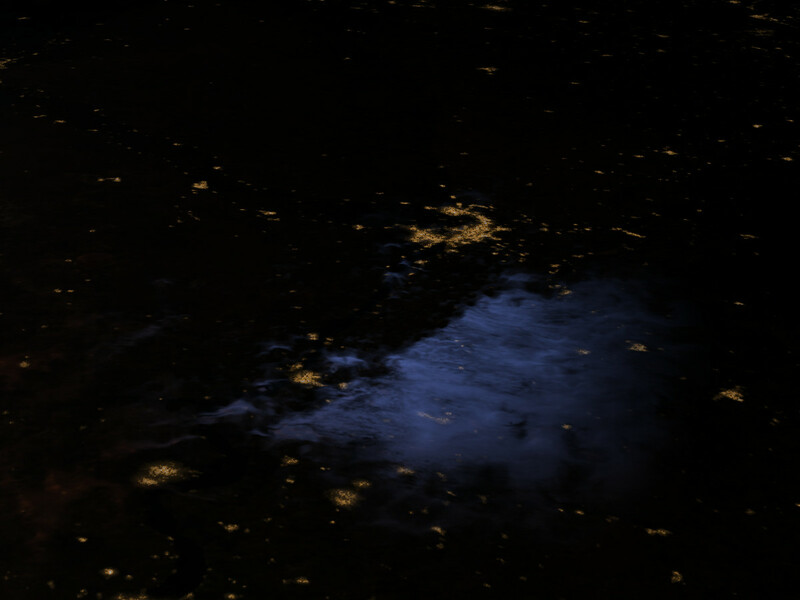 The characteristic electric blue glow of the atmosphere which is so prominently visible from low earth orbit is predominantly driven by Rayleigh scattering in the upper atmosphere. 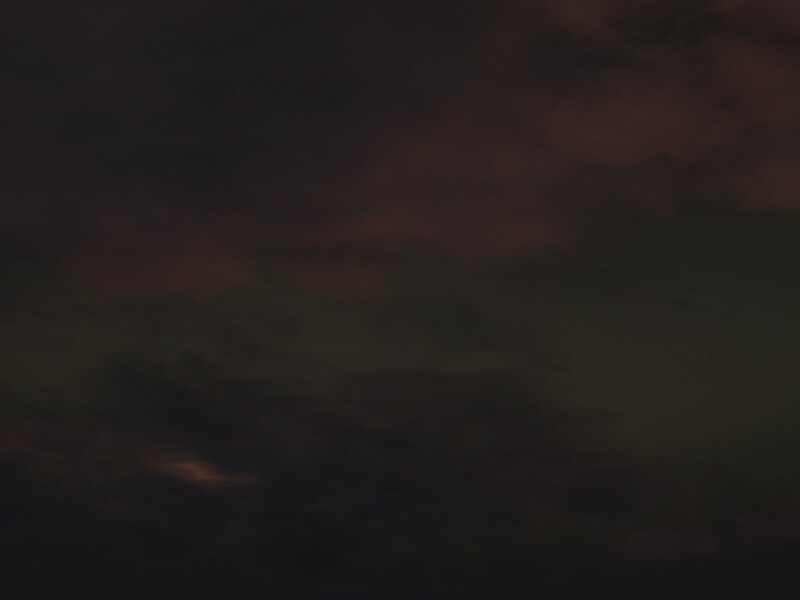 Although they are rendered with rather different techniques, clouds physically are wet haze – thin translucent clouds are Mie scatterers, and thick clouds are diffuse scatterers. Thus, thin clouds light up very brightly in a halo when the sunlight is seen through them due to O-ray Mie in-scattering, whereas thick clouds appear dark and hide the sun due to O-ray diffuse out-scattering. whereas for a high air pollution value the colors are much more strongly shifted towards the red-golden. 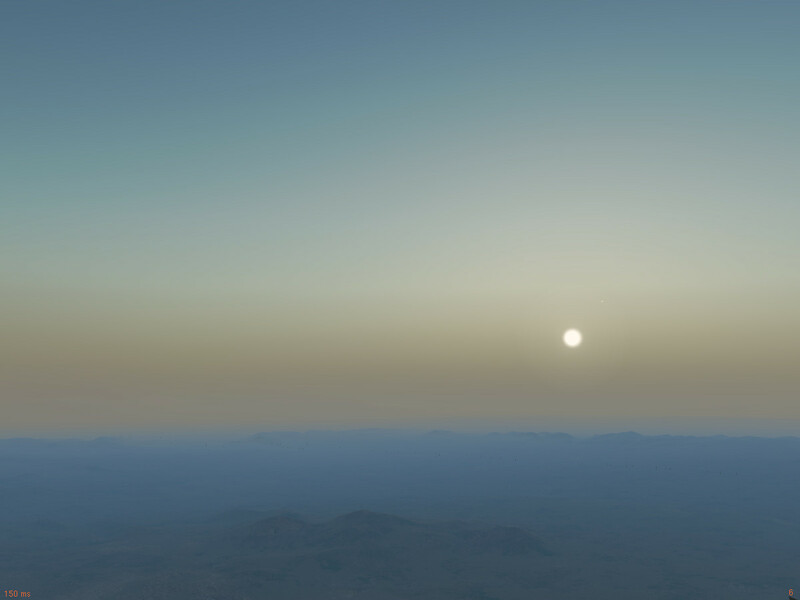 Diffuse haze in the atmosphere acts on the incoming light just the same way as a well-formed cloud layer – the light illuminating the clouds is reduced, and as the direct light is filtered out, the blue indirect I-ray Rayleigh in-scattering becomes more important, shifting colors to violet. At night, artificial light sources contribute a lot to the illumination – think of the orange glow of haze above a well-lit airport or a city. In principle, artificial light follows the same principles as sunlight, except that the intensity is usually far less, and so the paths through the atmosphere are smaller and effects are only visible in fairly dense fog. Then, often Mie-scattering can be observed, creating halos around lights seen through the fog. All the different scattering phenomena described above only scratch at the surface of what nature really does. In a real sunrise, clouds may cast shadows onto each other. There’s multiple scattering processes – a brightly illuminated haze layer high above may scatter lots of light down onto lower layers. 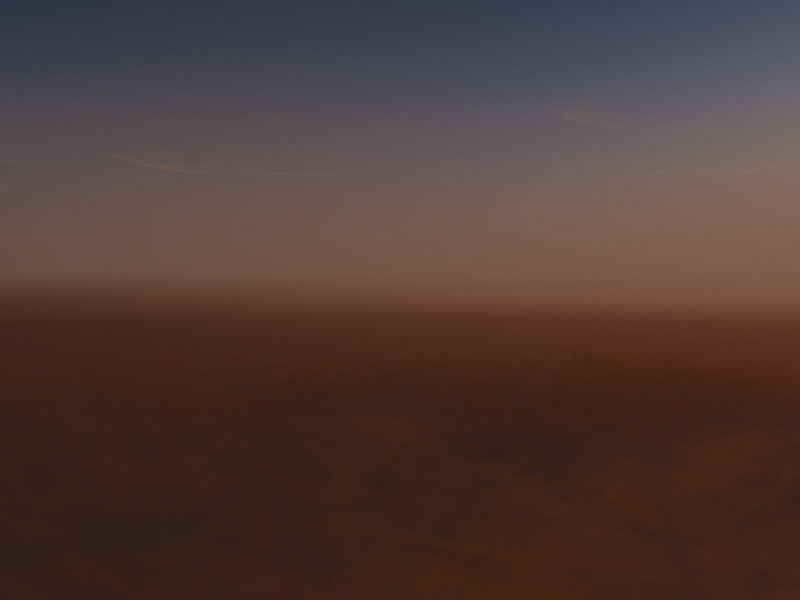 There’s genuinely colored hazes like dust in a sandstrom which change the colors of dawnlight in yet different ways. There are effects of the human perception which make the eye see very faint or very bright light in colors different from what they actually are (which is why moonlight, despite being actually white light, appears as blue). While ALS tries to capture some of these processes, nature still does infinitely more, and sometimes one wonders how nature manages to get it all done in real time. 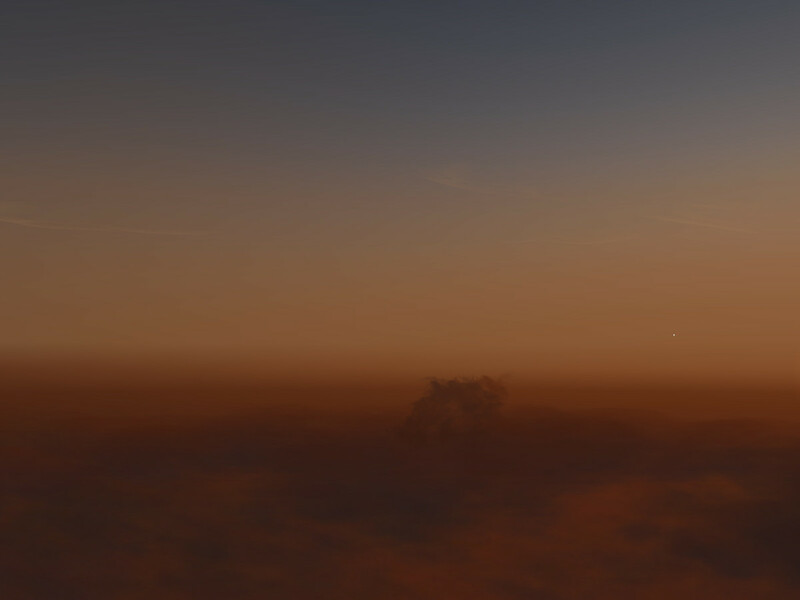 But even thinking about some of the phenomena causing it, you will never look at the play of haze and light the same way as before – be it in Flightgear or in reality. 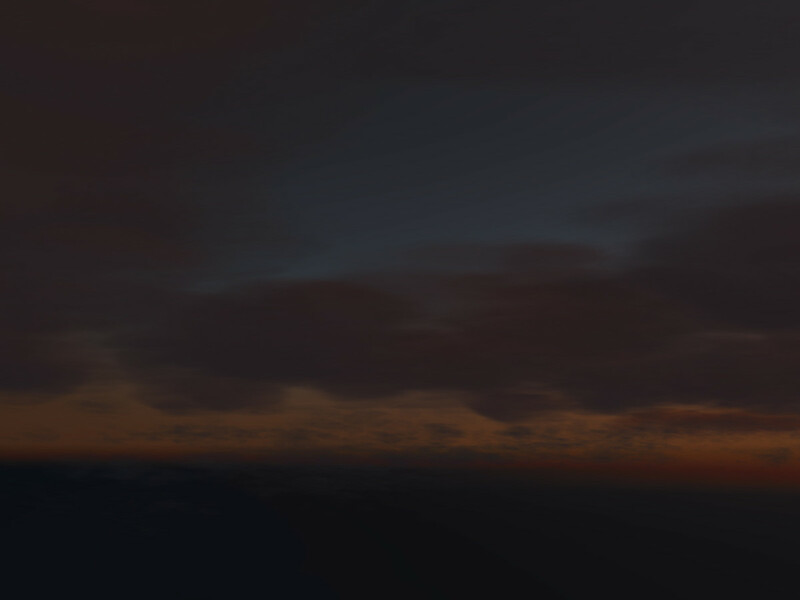 All the screenshots above are rendered with the current development version of Flightgear (FG 3.3) out of the box. 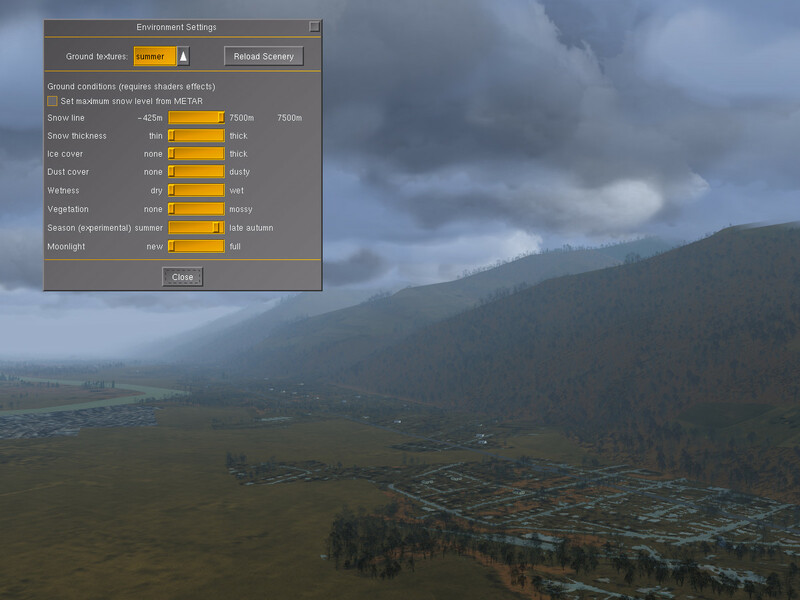 On a modern gaming laptop, in flight they typically render with 30+ fps (mainly dependent on visibility and LOD settings and the usage of hires scenery). 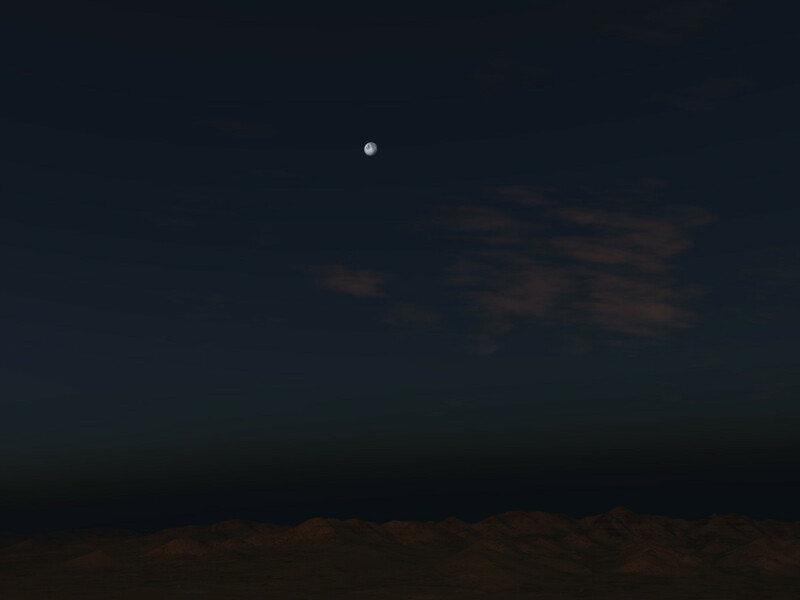 The ALS framework itself takes some 10 atmosphere-related input parameters to generate the visuals of the sky and of hazes, and this leads to an almost infinite variety. Unfortunately the majority of parameter combinations can not occur on Earth (ALS as such is quite capable of rendering a Martian sky), hence the raw input parameters are largely not under user-control. 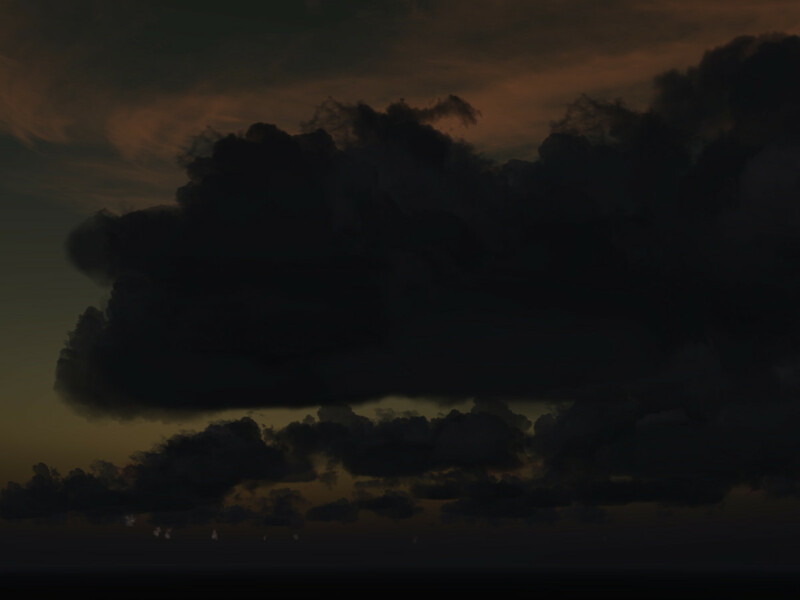 What limits the visuals ALS generates out of the box in practice is the actual range of parameters passed to the renderer by the weather simulation. 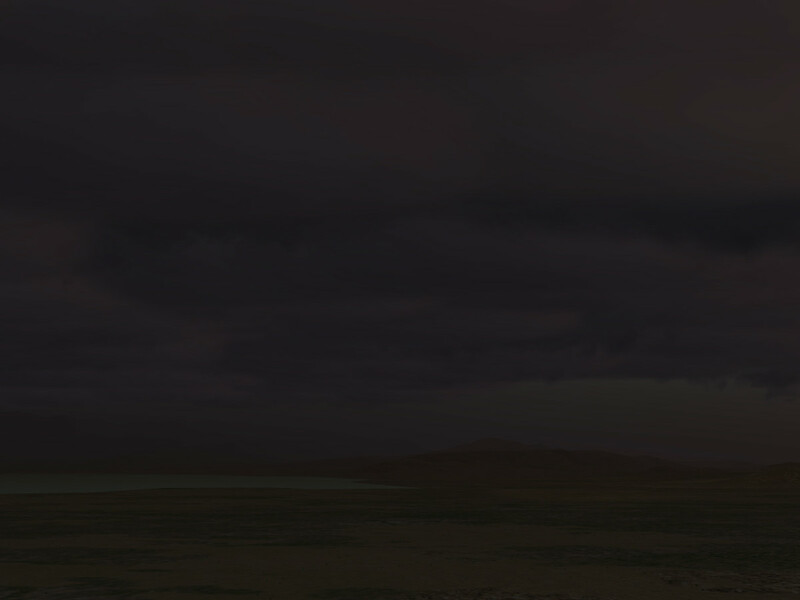 Here, Advanced Weather using the offline weather engine is somewhat more faithful in generating reasonable light propagation models in the lower atmosphere than Advanced Weather in METAR mode, which is in turn better than Basic Weather, but even Advanced Weather currently exhausts just a fraction of the possibilities ALS really offers. 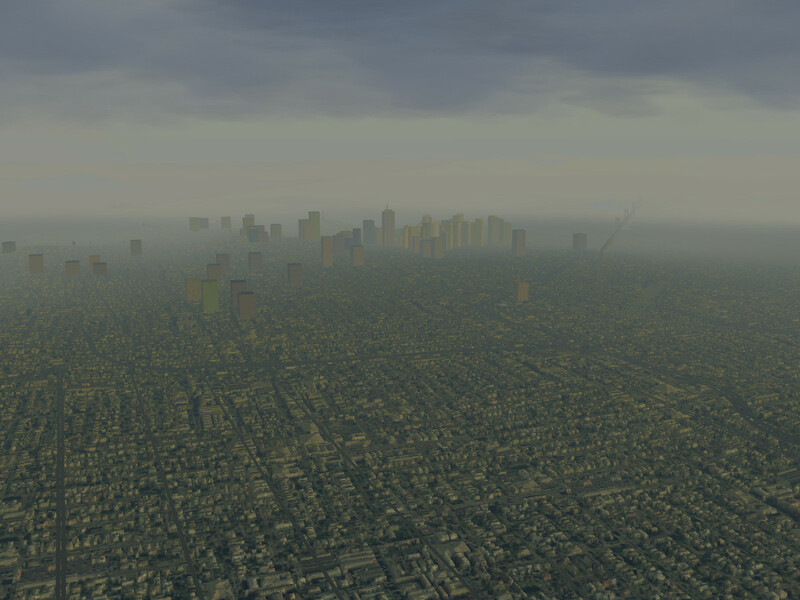 Modeling a compelling haze distribution and the resulting light attenuation in real time is a genuine challenge, since it is impossible to actually do the scattering calculations (which involve nested integrals) in anything resembling real time, so in every case, fast yet faithful approximations have to be found. 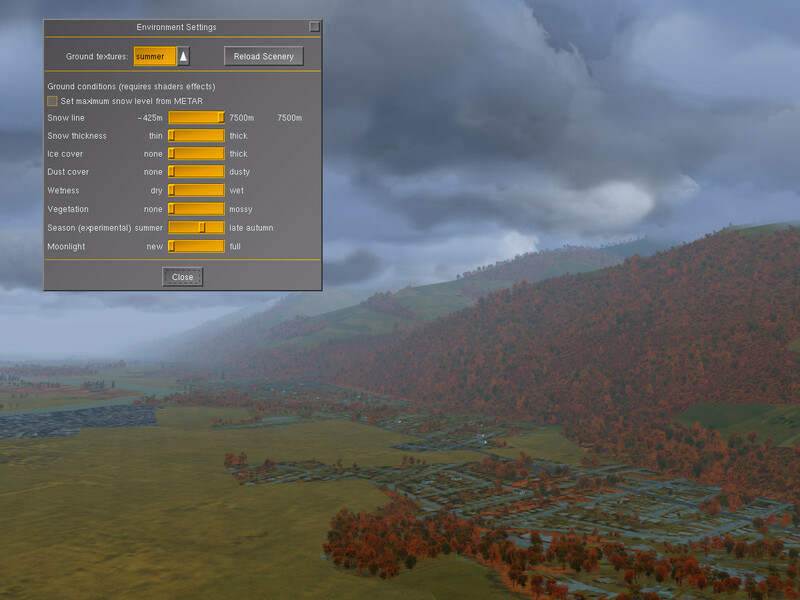 To experiment some with sunrises, try various weather scenarios and play with the lower haze settings and the air pollution on the Advanced Weather options panel. 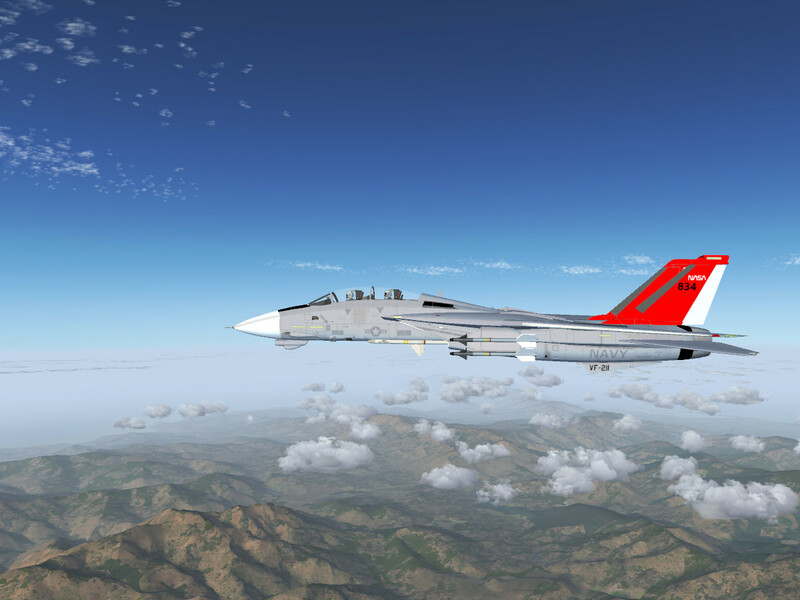 Thanks to Alexis Bory and Enrique Laso, the F-14b has been for a long time one of Flightgear’s most impressive 3d models, with a highly detailed cockpit and a large number of modeled systems. But it just got even better – are you ready for a ride? 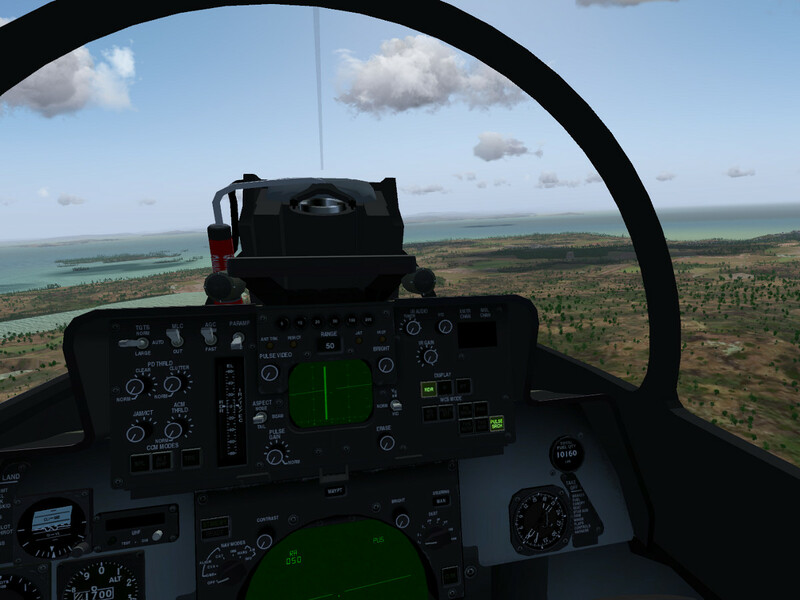 The 3d cockpit has received a number of additions, among them a master warning panel with working indicators, an engine control panel and a master generator control panel. Other switches, such as the fuel cutoffs on the glareshield panel, are now functional, such that an engine startup/shutdown procedure from the cockpit is now possible. 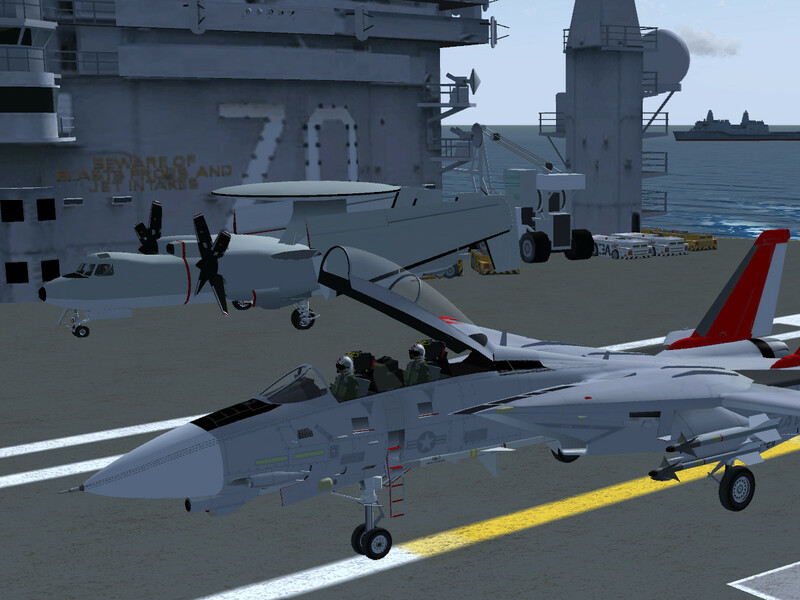 Just like the previous YaSim version, the new JSBSim F-14b supports a full range of military operations. 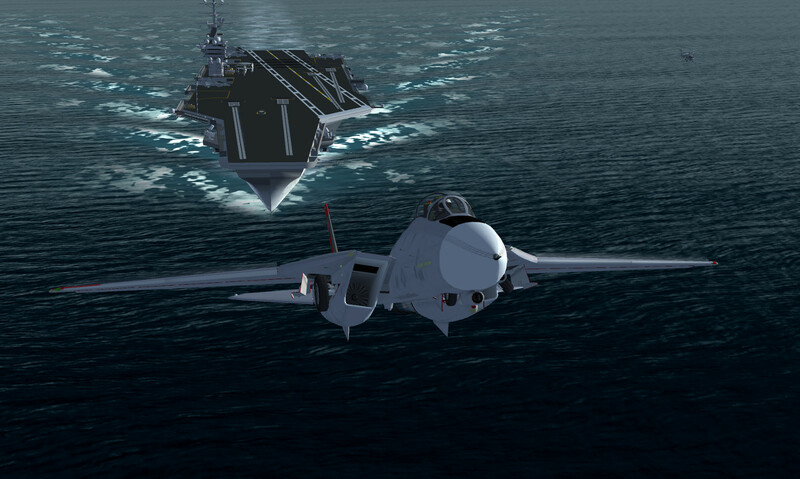 The plane is fully aircraft-carrier capable (due to the improved modeling of low airspeed behaviour, carrier landings are somewhat more difficult than with the YaSim version though). 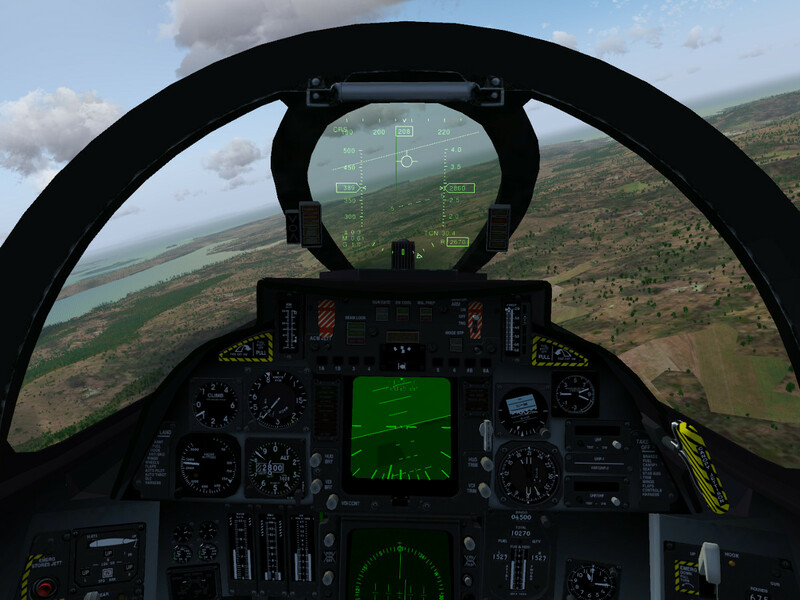 The plane also has a detailed radar with several different modes, capable of tracking targets, and the operation of the AIM-9M sidewinder missile is modeled as well as the M61A6 Vulcan gun. 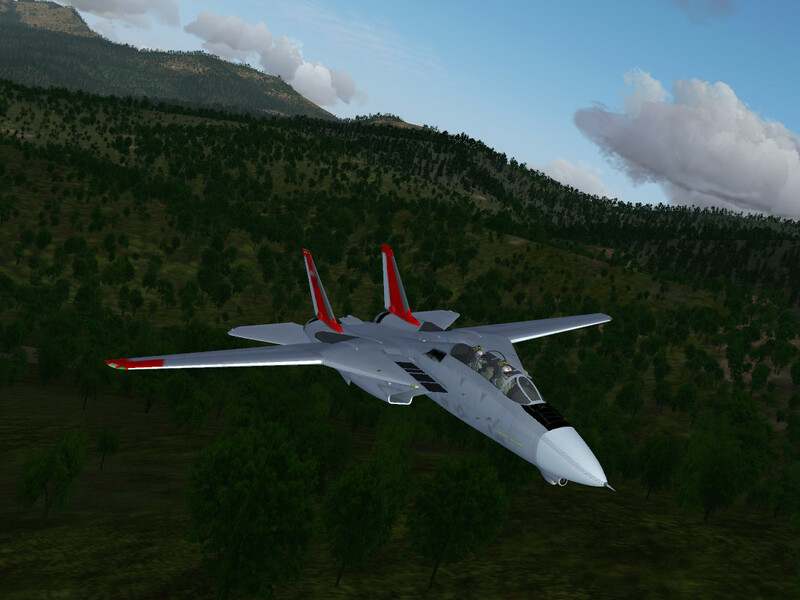 Enjoy the new F-14b along with many exciting new features on current GIT (3.3) or with the forthcoming stable release 3.4!